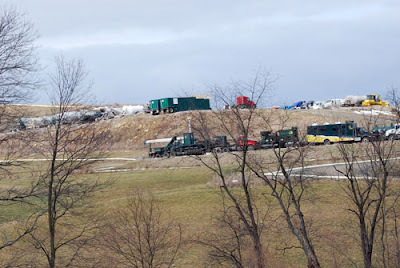 "Nothing can prepare a person for the reality of high-volume "fracking"; certainly not the coaxing of suave salesmen who convince landowners to sign leases by telling them that they've won ‘the natural gas sweepstakes.’ And certainly not their description of benign completed gas wells that stand in green meadows, silently pumping money out of the ground. "When the frackers come, they arrive like an invading army…Trucks by the hundreds, tankers, dump trucks, drilling rigs, fracking rigs. Five-acre drilling pads were bulldozed in the middle of farmers' best fields, million-gallon ponds were installed, roads were built, woods and fields were trenched and bulldozed for tie lines…"
"…Drilling rigs went up at an unbelievable rate. From one spot on our farm, I counted eight rigs. "Then the generators started. You could hear them a half-mile away…Then the pumping stations - small, industrial sites with buildings and pipes sticking up out of the ground…[at] the site of some of the first Marcellus wells in Bradford County, Pennsylvania…"
"…[R]esearch firm IHS iSuppli [reports] U.S. solar installations are predicted to rise 166% this year, led by California, which will account for nearly 1 GW of new capacity…New Jersey is expected to be second with 260 MW, followed by Arizona with 240 MW. New Mexico and Nevada round out the top five…[A]n additional 1.2 GW of solar will come online in California in 2012." 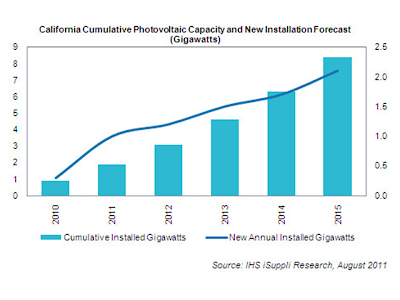 [Troy Dalbey, managing director of North America, Upsolar:] "California's representation in the U.S. solar market reached 45 percent this year, up from 38 percent in 2010. With so much activity and growth, the state is ripe with opportunities for sales and strategic partnerships…"
"Supporting Scotland’s goal to produce 100 percent of its electricity from renewable sources by 2020, GE… is supplying nine of its 2.75 megawatt wind turbines for the Little Raith Wind Farm project that recently began construction near Lochgelly in Fife, Scotland. 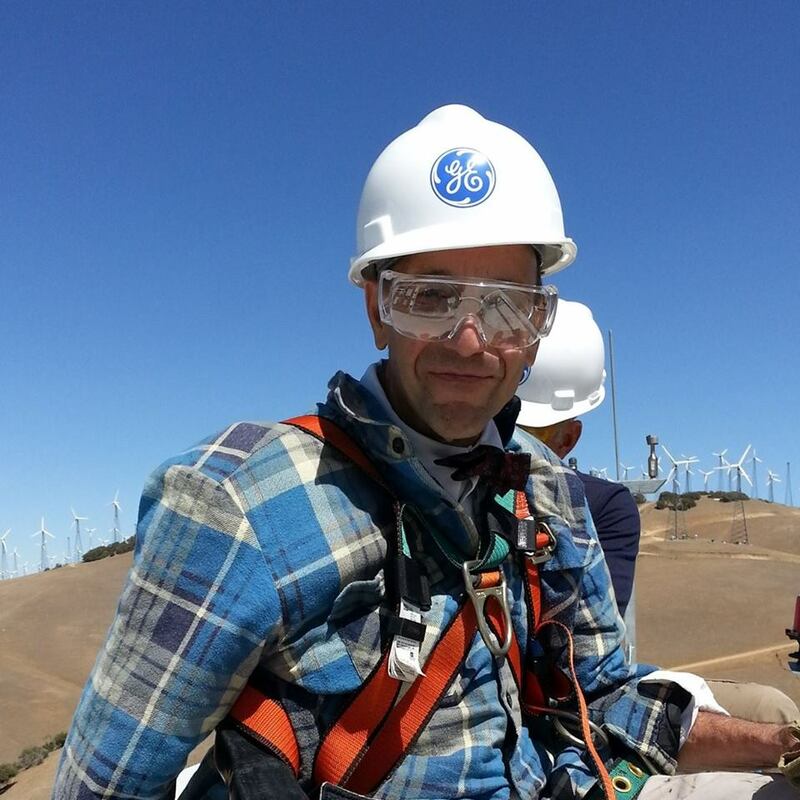 The project marks the commercial debut of GE’s 2.75 megawatt wind turbine technology in Northern Europe. "Little Raith is the first commercial wind farm to be built in Fife, which is Scotland's third largest local municipality by population. 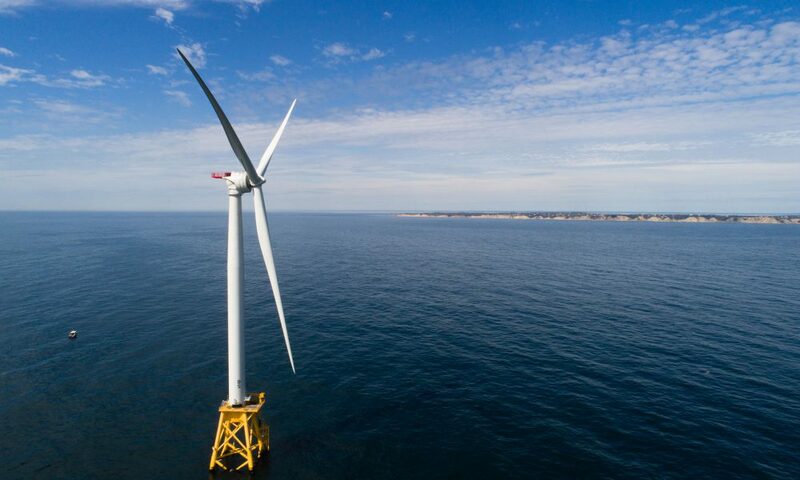 The nine-turbine wind farm will have an installed capacity of 24.75 megawatts of green energy, which represents an important step in reducing Fife’s carbon emissions by 25 percent by 2013 as the county works to increase its production of cleaner energy." 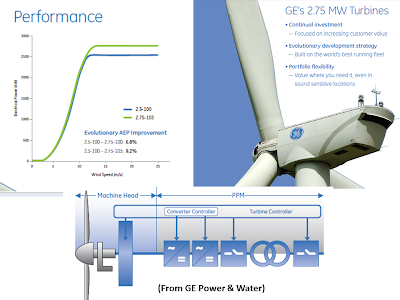 "…GE’s ecomagination-qualified 2.75 megawatt wind turbine technology is the latest in the company’s portfolio of multi-megawatt wind turbines developed to suit a variety of wind regimes, including the windier climate of Scotland…The evolution of GE’s multi-megawatt turbine design began with the 2.5 megawatt turbine introduced in 2004. GE’s 2.5-100 rotor [as well as the 2.75 megawatt 100] and the 2.75-103m rotor…[were designed] with high reliability [permanent magnet generators]…"
"The slowdown has already claimed its first victim, as Germany’s Repower told the Financial Times that it planned to end wind turbine production in China by selling their majority stake in a turbine factory in Inner Mongolia……[T]urbine prices have plummeted in recent years as China’s turbine-making capacity has outstripped demand…China’s explosive growth in wind energy took the country from having almost no wind power five years ago, to becoming the world’s largest installer of new turbines last year…"
"…In the first half of this year global wind installations were up 15 per cent…But China expanded by just 2.6 per cent, and that growth is expected to turn negative…European demand for wind turbines has been growing healthily…but could be hurt by austerity measures…[A bright spot] is Germany, which is expected to boost wind power to compensate for use of less nuclear power…"
"The European Commission has confirmed a €9.1 billion investment in the EU’s energy transmission networks, as part of a €50 billion infrastructure package…The 2014-20 budget plans will include new grid connections to accommodate the rapid growth of onshore and offshore wind power. "Under the draft budget, €9.1 billion is allocated for the creation of energy priority corridors to improve the flow of electricity, gas and oil…"
"…[This is] an enormous increase on the €163 million earmarked for energy infrastructure in the current budget…[but] it was unclear how much of it would be allocated for wind energy…"
[Christian Kjaer, chief executive, European Wind Energy Association:] "While [the €9.1 billion] is a substantial increase in funding for what has been for a long time under-funded, it remains to be seen how this pot of money will be divided up between electricity, gas, oil and carbon capture and storage (CCS) infrastructure projects…The inclusion of CCS — a technology still not commercially viable and one for which the infrastructure needs are unknown — is strange in itself." "Return on investment from solar power is higher than from any other renewable energy source…[and] large-scale technological improvements…are expected to bring down the cost of power generation to $1/W by 2020, according to a new report from SBI Energy. 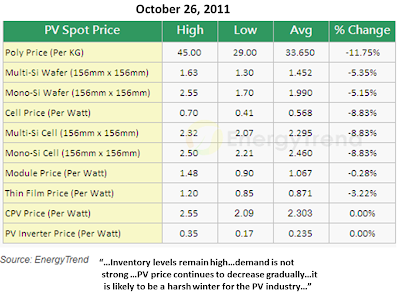 The payback period for a typical PV project has…come down to three to five years, from seven to 10 years. "The report predicts that the cost of solar power production will decrease by half every 10 years, reaching as low as $0.50/W by 2030. 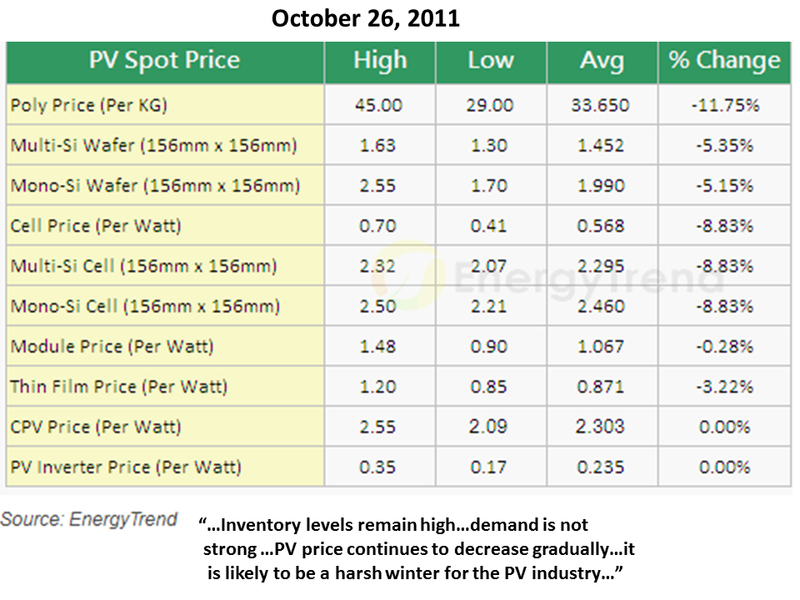 Large-scale adoption of PV technology and the emergence of low-cost production sites in China, Taiwan and other Asian markets will further reduce the cost of production..."
"China's market is likely to reach the 1 GW cumulative installation mark this year…India and the rest of the Asia Pacific region hold long-term growth potential, with clear government road maps for increasing the share of renewable energy generation…"
"A Japanese consortium including Mitsui Chemicals Inc…[is considering] the nation's biggest solar and wind hybrid power plant with capacity of 56 megawatts [50 MW solar power and 6 MW of wind power] in central Japan for around 18 billion yen ($234 million)." "The group is considering starting construction of the plant…in Aichi prefecture in June next year and start commercial operations of the plant in September 2013…The consortium also includes Mitsui & Co , Toagosei Co , Toshiba , Toray Industries and Mitsui Engineering & Shipbuilding Co . Chubu Electric Power is also considering participating…"
This is truly an outrage. There are 3 possibilities: (1) Government is too corrupt or incompetent to undertake such an ambition, in which case such plans should never be; (2) The Obama administration is too corrupt or incompetent to undertake such an ambition, in which case they should be thrown out; or (3) something like this is really hard and doing it requires effective government of the kind the Obama administration is trying, harder than any that has come to Washington in a long time, to be, in which case shoulders need to go harder to the wheel. It had better be (3), or Miami and New York may, in 2050, look like today's Bangkok. 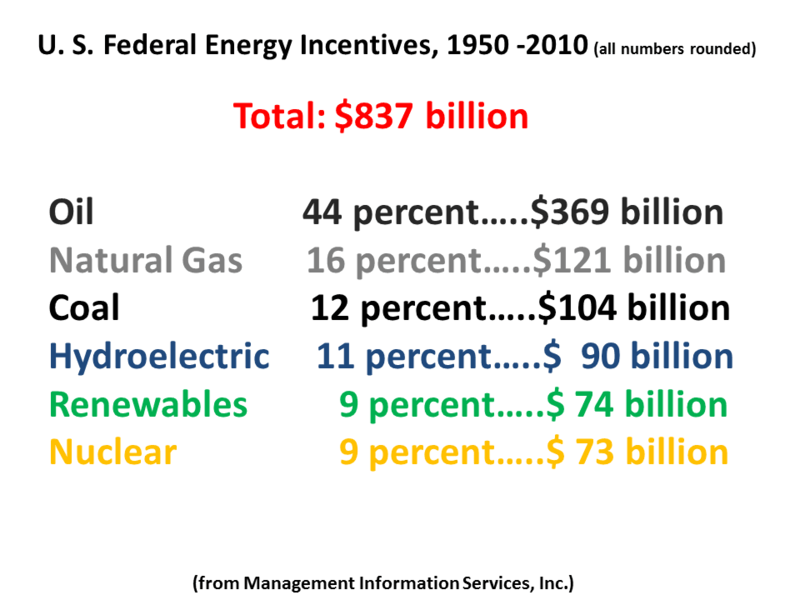 "An updated study on federal energy incentives confirms that the main beneficiaries of more than $800 billion of federal energy incentives over the past six decades have been the oil and natural gas industries. 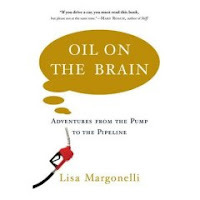 The oil and natural gas industries together garnered 60 percent of federal incentives between 1950 and 2010… 44 percent of the roughly $837 billion in federal support [went] to the oil sector, according to… consulting firm Management Information Services Inc (MISI). 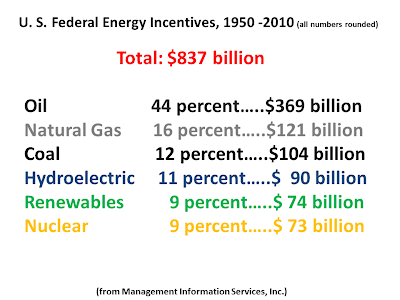 "…[T]he oil industry has benefited from $369 billion in combined incentives, with natural gas receiving $121 billion…Of the total incentives provided since 1950, nuclear energy has received nine percent ($73 billion), while renewable energy also has received nine percent ($74 billion). 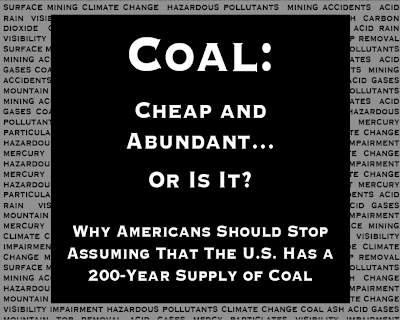 Coal and hydroelectric energy sources, meanwhile, have received 12 percent ($104 billion) and 11 percent ($90 billion) of the total respectively." "The report identifies six categories of incentives: tax policy, regulation, research and development funding, market activity, government services and disbursements…Tax policy has been, by far, the most widely used…accounting for $325 billion (45 percent) of all federal expenditures since 1950…Federally funded regulation and R&D funding, at about 20 percent each, are the second- and third-largest incentives. 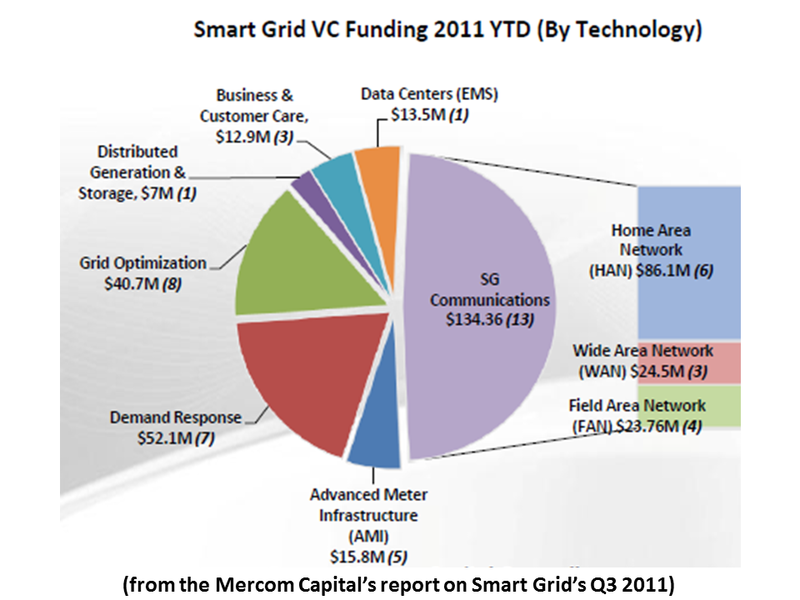 "Each energy type benefits from a mix of federal incentives. Federal tax concessions for oil and gas are the largest of all incentives, amounting to about 80 percent of all tax-related allowances for energy…The federal government's primary incentive to nuclear energy has been in the form of R&D programs…[E]xpenditures for nuclear, coal and renewables expanded greatly after 1975, but this increase was especially marked for coal and renewables…Annual R&D expenditures for all three technologies peaked between 1979 and 1981, and then declined dramatically…"
"Per capita residential energy consumption in the United States remained generally flat since the 1973 Arab oil embargo. Several factors contribute to this trend. 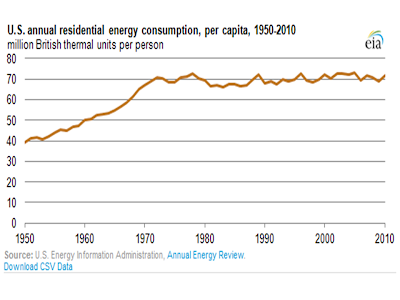 Geographic shifts in the U.S. population towards warmer and drier climates partially countered a long-term shift towards larger homes, which require more energy to heat, cool, and light. 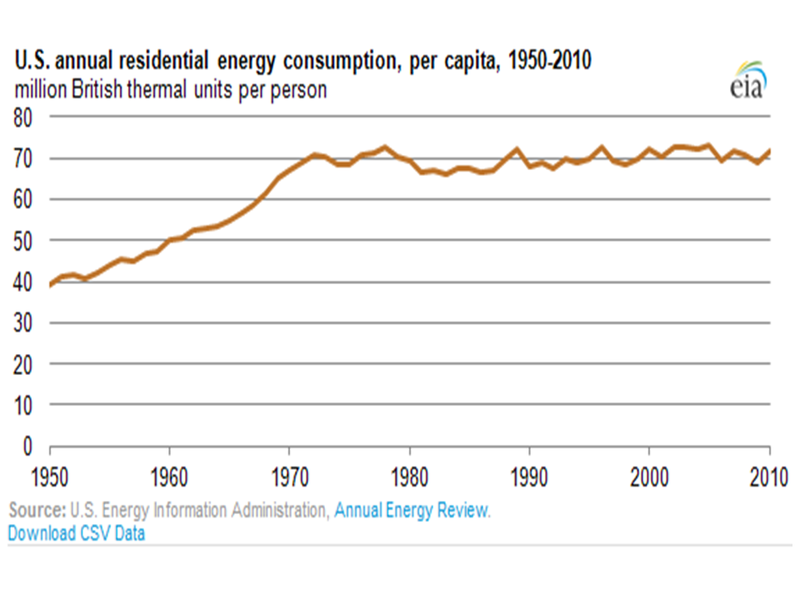 "…Federal and State legislation mandate minimum energy efficiency standards for several types of household appliances, offsetting greater energy use from an increasing number of electronic devices and appliances…[and other played] a role in per-capita energy consumption." "…Federal and State legislation (starting with the National Appliance Energy Conservation Act of 1987) mandate minimum energy efficiency standards for…appliances such as furnaces, air conditioners, heat pumps, water heaters, refrigerators, and freezers. While there is no Federal building energy code, several State and local governments have established standards for the efficiency of new residential buildings." FPL bills will rise to pay for nuclear projects; State utility regulators agreed to allow utility companies to charge customers so they can invest in plans for nuclear power. 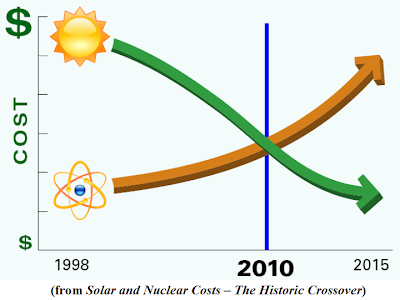 "Florida Power & Light…[will] increase the charge on consumers’ household electric bills that will go towards investing in nuclear energy — even if the utility never ends up building any new nuclear power plants. 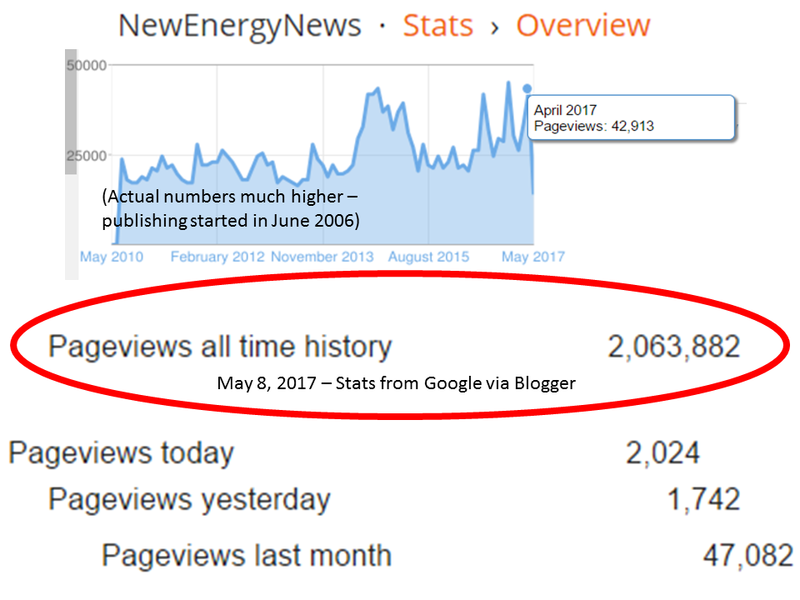 "The charge, which will amount to $2.20 every month for a household using the average 1,000 kilowatt hours of electricity a month, was approved unanimously by the Public Service Commission, which regulates state utilities…Under a state law approved by the Legislature in 2006, the company can collect the money for new nuclear plants without having to commit to building the plants…"
"…FPL says its customers will benefit from the improvements because expanded nuclear power will offset the need to buy natural gas and other fuels…[Opponents] argued that the money is a bad deal for consumers because there is no guarantee that FPL will build the new plants…Green energy advocates also warn that the process locks customers into paying for expensive nuclear plants for decades when other, more efficient energy options may become available…"
"Six other oil companies have pleaded not guilty to charges that their oil waste pits killed birds. They were arraigned last month in U.S. District Court in Bismarck…Slawson accounted for the bulk of the 28 dead birds discovered by federal wildlife officials in uncovered waste pits operated by the companies in May and June. Most of the birds were ducks and none were identified as being endangered. Killing endangered species can lead to felony charges that bring fines of up to $250,000." 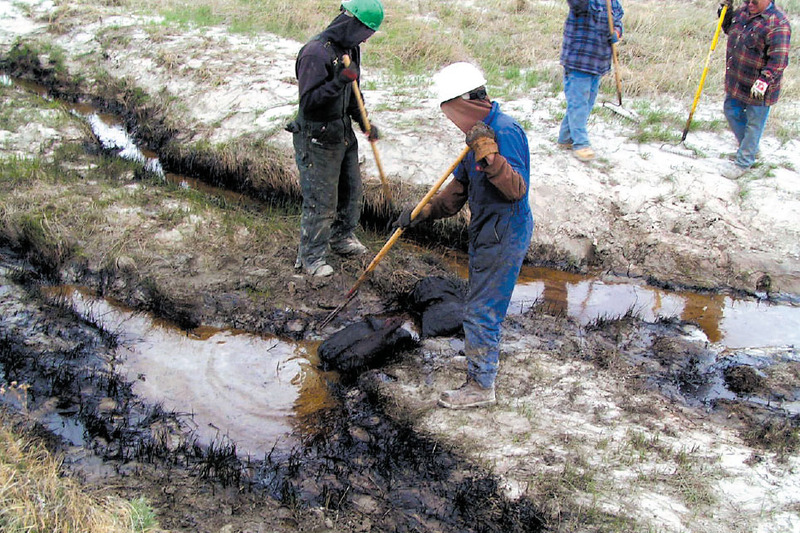 "Companies in North Dakota [the nation’s fourth-largest oil state, producing] about 450,000 barrels of oil daily from about 6,000 wells,] are required to cover the so-called reserve pits with netting if they are open for more than 90 days after drilling operations. The waste pits, which can contain oil, diesel, drilling muds and chemicals, are about the size of a large swimming pool, and birds sometimes mistake them for a good place to land. "Also charged…are ConocoPhillips…Newfield…Brigham Oil and Gas …Continental Resources…Petro Hunt…and Fidelity…[A] ll seven companies have previously been fined for violating the Migratory Bird Act…North Dakota regulators are considering banning the oil waste pits and requiring companies to recycle liquid drilling waste amid a spate of toxic discharges and an increasing number of migrating birds that have died by mistaking the polluted ponds for fresh water. State officials have said companies have sometimes foregone netting because fines can be cheaper than installing and maintaining netting…[R]egulators in June levied $3 million in fines against 20 companies…"
While the emissions of developing countries (non-Annex I2) continued to grow in 2009 (+3.3%), led by Asia and the Middle East, the emissions of developed countries (Annex I3) fell sharply (-6.5%), putting them at 6.4% below their 1990 collective level. It should be noted that 2009 emission levels for the group of countries participating in the Kyoto protocol were 14.7% below their 1990 level. The changes were not equal across fuels, regions and sectors. 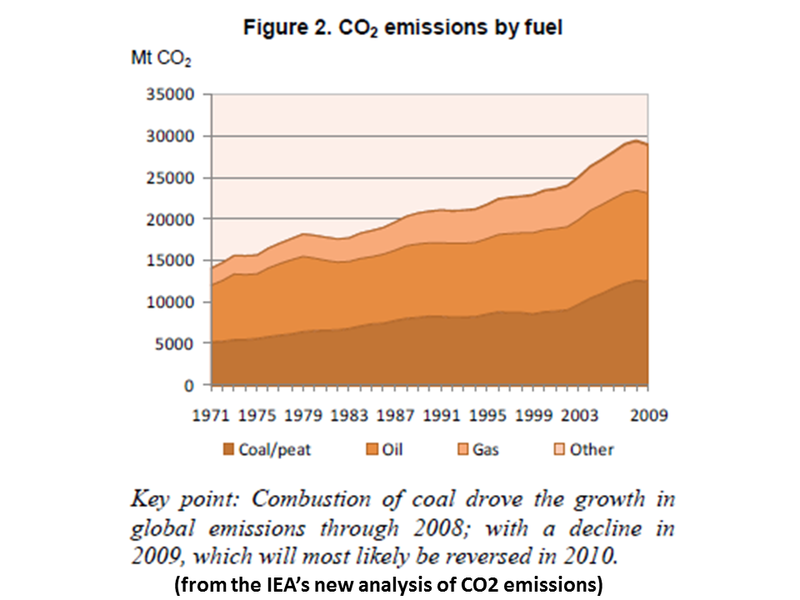 The increase in emissions for developing countries was primarily due to an increase in coal demand (with oil and gas increasing more modestly). On the contrary, the reduction in emissions for developed countries was more spread out over fuels: 53% of the decrease came from coal, while 30% from oil and 18% from natural gas (Figure 1). Early indications suggest that CO2 emissions trends in developing countries in 2010 will continue to increase, through growing consumption of fossil fuels in some of the larger countries. The trend of emissions in developed countries will rebound in 2010 and CO2 emissions will likely be at a similar level to 2008, before the recent financial crisis and the slowdown in economic activity. In the medium term, Annex I CO2 emissions are expected to rebound when economic conditions pick up. In its New Policies Scenario, the World Energy Outlook (WEO 2010)4 projects that world CO2 emissions from fuel combustion will continue to grow unabated, albeit at a lower rate, reaching 35.4 Gt CO2 by 2035. This is an improvement over the Current Policies Scenario of the WEO and is in line with the worst case scenario presented by the Intergovernmental Panel on Climate Change (IPCC)5 in the Fourth Assessment Report (2007), which projects a world average temperature increase of between 2.4°C and 6.4°C by 2100. In 2009, 43% of CO2 emissions from fuel combustion were produced from coal, 37% from oil and 20% from gas. Growth of these fuels in 2009 was quite different, reflecting varying trends that are expected to continue in the future. 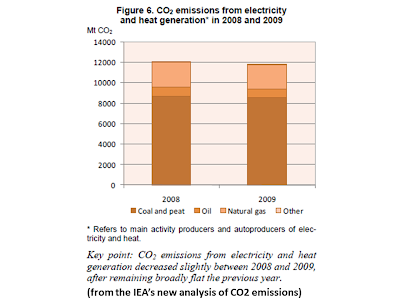 Between 2008 and 2009, CO2 emissions from the combustion of coal decreased by nearly 1% and represented 12.5 Gt CO2. Currently, coal is filling much of the growing energy demand of those developing countries, such as China and India, where energy-intensive industrial production is growing rapidly and large coal reserves exist with limited reserves of other energy sources (Figure 2). Without additional measures, the WEO 2010 projects that emissions from coal will grow to 14.4 Gt CO2 in 2035. 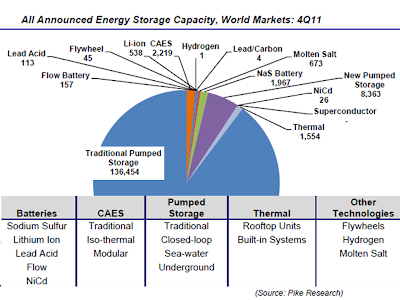 Energy Technology Perspectives (ETP 2010) shows that intensified use of coal would substantially increase CO2 emissions unless there was a very widespread deployment of carbon capture and storage (CCS). 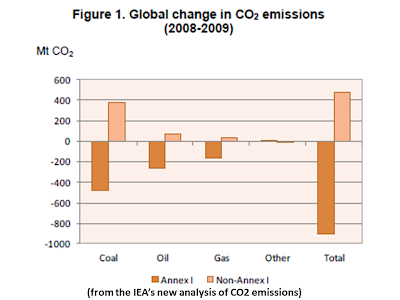 CO2 emissions from oil fell in 2008, decreasing 2.2% throughout the year. The decreasing share of oil in total primary energy supply (TPES), as a result of the growth of coal and the penetration of gas, put downward pressure on CO2 emissions from oil, which produced 10.6 Gt CO2 in 2009. However, the WEO 2010 projects that emissions from oil will grow to 12.6 Gt CO2 in 2035. 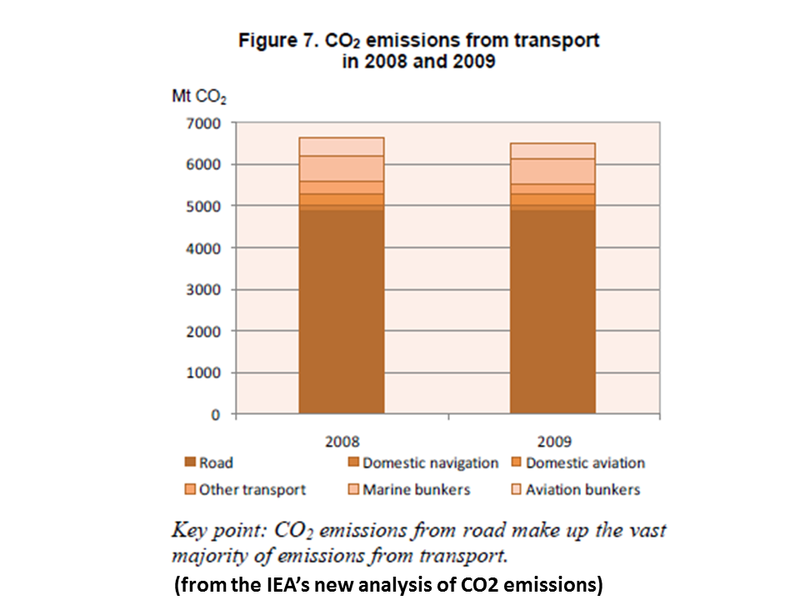 Emissions of CO2 from gas in 2009 represented 5.8 Gt CO2, 2.2% higher than in the previous year. Again, the WEO 2010 projects emissions from gas will continue to grow, rising to 8.4 Gt CO2 in 2035. 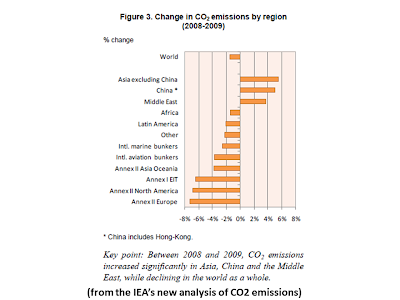 Between 2008 and 2009, CO2 emission trends varied markedly by region. As mentioned earlier, CO2 emissions from non-Annex I countries grew by 3.3%, while those of Annex I countries decreased by 6.5%, causing the aggregate emissions of the developing countries to increase their small lead over those of the developed countries. 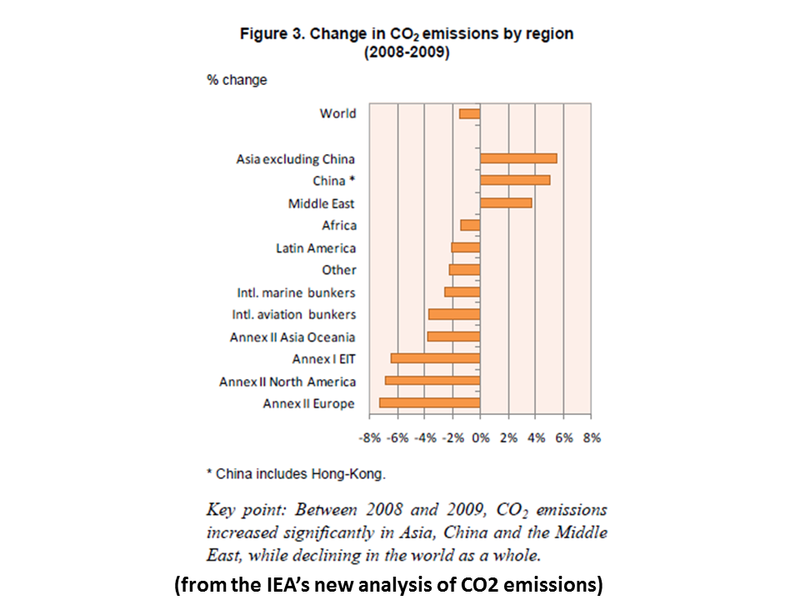 At the regional level (Figure 3), CO2 emissions increased significantly in Asia (5.5%), China (5%) and the Middle East (3.6%). On the other hand, between 2008 and 2009, CO2 emissions decreased in all other regions, ranging from1.5% in Africa to 7.4% in the Annex II European countries. However, regional differences in contributions to global emissions conceal even larger differences among individual countries (Figure 4). 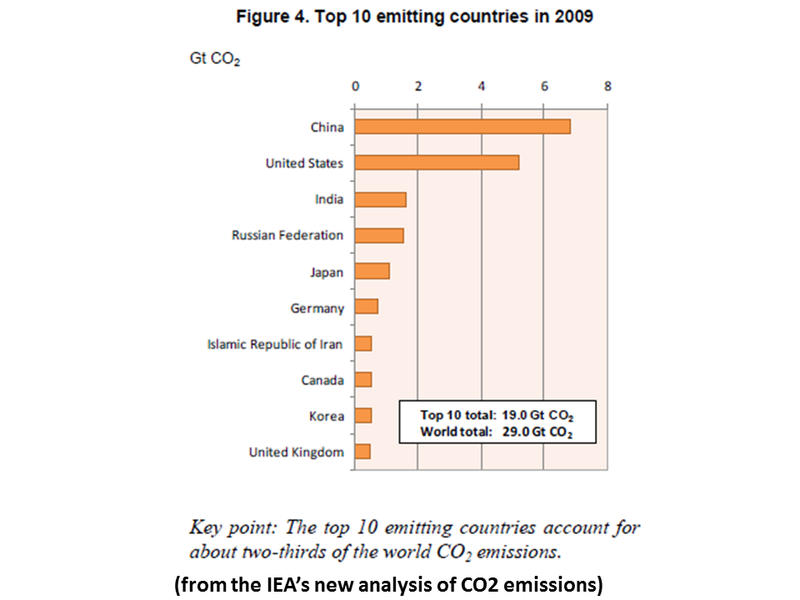 Two-thirds of global emissions for 2009 originated from just ten countries, with the shares of China and the United States far surpassing those of all others. Combined, these two countries alone produced 12.0 Gt CO2, 41% of world CO2 emissions. Two sectors, electricity and heat generation and transport, produced nearly two-thirds of global CO2 emissions in 2009 (Figure 5). Generation of electricity and heat was by far the largest producer of CO2 emissions and was responsible for 41% of the world CO2 emissions in 2009. Worldwide, this sector relies heavily on coal, the most carbon-intensive of fossil fuels, amplifying its share in global emissions. Countries such as Australia, China, India, Poland and South Africa produce between 68% and 94% of their electricity and heat through the combustion of coal. 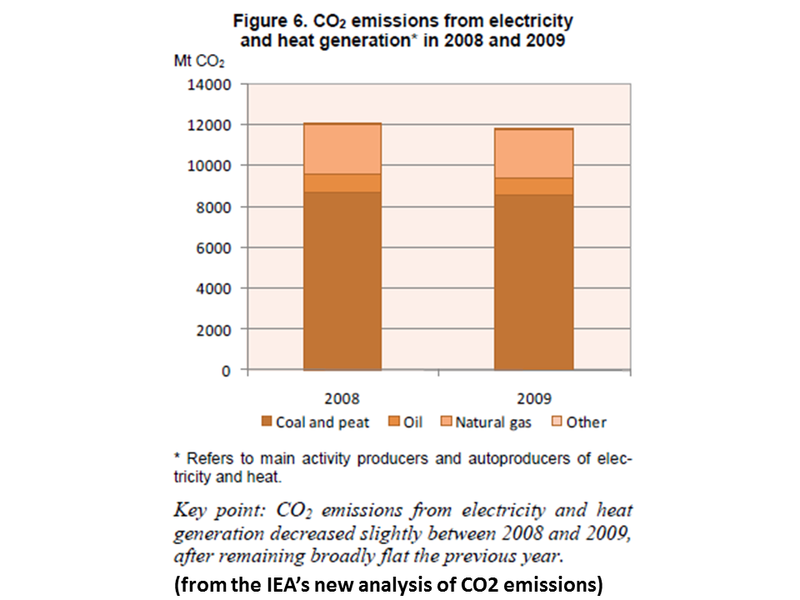 Between 2008 and 2009, total CO2 emissions from the generation of electricity and heat decreased by 1.7% (Figure 6), while the fuel mix stayed similar. 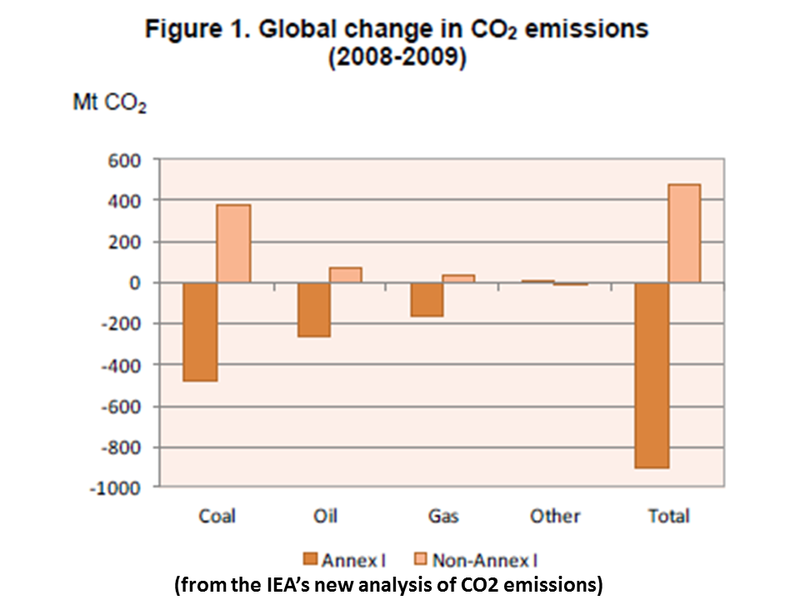 CO2 emissions from oil decreased the most, by 2.8%, while coal and gas decreased by 1.9% and 0.7% respectively. The future development of the emissions intensity of this sector depends strongly on the fuels used to generate the electricity and on the share of non-emitting sources, such as renewables and nuclear. By 2035, the WEO 2010 projects that demand for electricity will be approximately three-quarters higher than current demand. This demand will be driven by rapid growth in population and income in developing countries, by the continuing increase in the number of electrical devices used in homes and commercial buildings, and by the growth in electrically driven industrial processes. Meanwhile, renewables-based electricity generation is expected to continue growing over the next 25 years, benefiting from government support, declining investment costs and rising fossil-fuel prices. The share of renewables in total electricity generation rises from 19% in 2008 to 23%, 32% and 45% in the Current Policies, New Policies and 450 scenarios, respectively. Transport, the second-largest sector, represented 23% of global CO2 emissions in 2009. 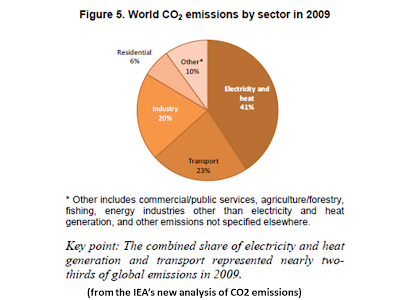 CO2 emissions in this sector decreased between 2008 and 2009 by 1.7% (Figure 7). The United States has the highest level of passenger travel per capita in the world (more than 25 000 km per person per year). Until recently, lower fuel prices in the United States contributed to the use of larger vehicles, while in Europe higher fuel prices encouraged improved fuel economy (along with the EU voluntary agreement with manufacturers). As a result, there is more than a 50% variation in the average fuel consumption of new light-duty vehicles across OECD member countries (ETP 2010, p. 262). Global demand for transport appears unlikely to decrease in the foreseeable future; the WEO 2010 projects that transport fuel demand will grow by about 40% by 2035. To limit emissions from this sector, policy makers should first and foremost consider measures to encourage or require improved vehicle efficiency, as the United States has recently done and the European Union is currently doing as a follow-up to the voluntary agreements. Policies that encourage a shift from cars to public transportation and to lower emission modes of transportation can also help. Finally, policies can encourage a shift to new, preferably low-carbon fuels. These include electricity (e.g. 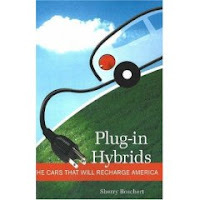 electric and plug-in hybrid vehicles), hydrogen (e.g. through the introduction of fuel cell vehicles) and greater use of biofuels (e.g. as a blend in gasoline and diesel fuel). To avoid a rebound in transport fuel demand, these moves must also be backed up by emissions pricing or fuel excise policies. These policies would both reduce the environmental impact of transport and help to secure domestic fuel supplies, which are sometimes unsettled by the threat of supply disruptions, whether from natural disasters, accidents or the geopolitics of oil trade. As these policies will ease demand growth, they are also likely to help reduce oil prices below what the prices might otherwise be. Indicators such as those briefly discussed in this section strongly reflect energy constraints and choices made to supply the economic activities of each country. They also reflect sectors that predominate in different countries’ economies. 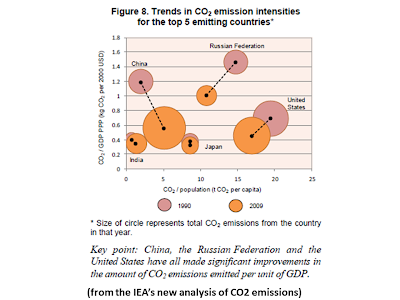 In 2009, the largest five emitters (China, the United States, India, the Russian Federation and Japan) comprised 45% of the total population and together produced 56% of the global CO2 emissions and 51% of the world gross domestic product (GDP).7 However, the relative shares of these five countries for all three variables were very diverse. In the United States, the large share of global emissions is associated with a commensurate share of economic output (as measured by GDP), the largest in the world. Japan, with a GDP more than double that of the Russian Federation, emits 29% less than the Russian Federation. Although climate and other variables also affect energy use, relatively high values of emissions per GDP indicate a potential for decoupling CO2 emissions from economic growth. Possible improvements can derive from fuel switching away from carbon-intensive sources or from energy efficiency at all stages of the energy supply chain (from fuel extraction to energy end-use).8 Among the five largest emitters of CO2 in 2009, China, the Russian Federation and the United States have significantly reduced their CO2 emissions per unit of GDP between 1990 and 2009 (Figure 8). 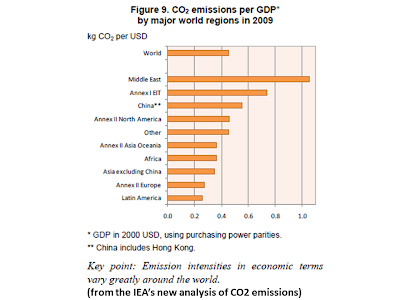 The other two countries, India and Japan, already had much lower emissions per GDP. Worldwide, the highest levels of emissions per GDP are observed for the oil and gas exporting region of the Middle East and for the relatively energy-intensive Economies in transition EITs9 (Figure 9). China emissions per GDP have fallen close to the level of the United States. As compared to emissions per unit of GDP, the range of per capita emission levels across the world is even larger, highlighting wide divergences in the way different countries and regions use energy. In 2009, the United States alone generated 18% of world CO2 emissions, despite a population of less than 5% of the global total. Conversely, China contributed a comparable share of world emissions (24%) while accounting for 20% of the world population. 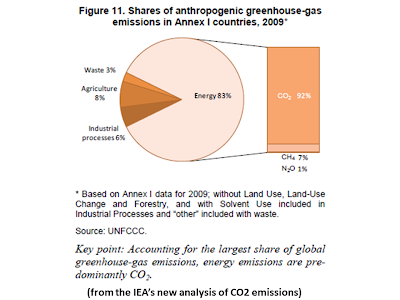 India, with 17% of world population, contributed more than 5% of the CO2 emissions. Among the five largest emitters, the levels of per capita emissions were very diverse, ranging from 1 t of CO2 per capita for India and 5 t for China to 17 t for the United States. 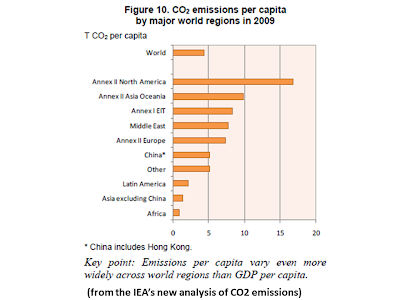 Industrialised countries emit far larger amounts of CO2 per capita than the world average (Figure 10). 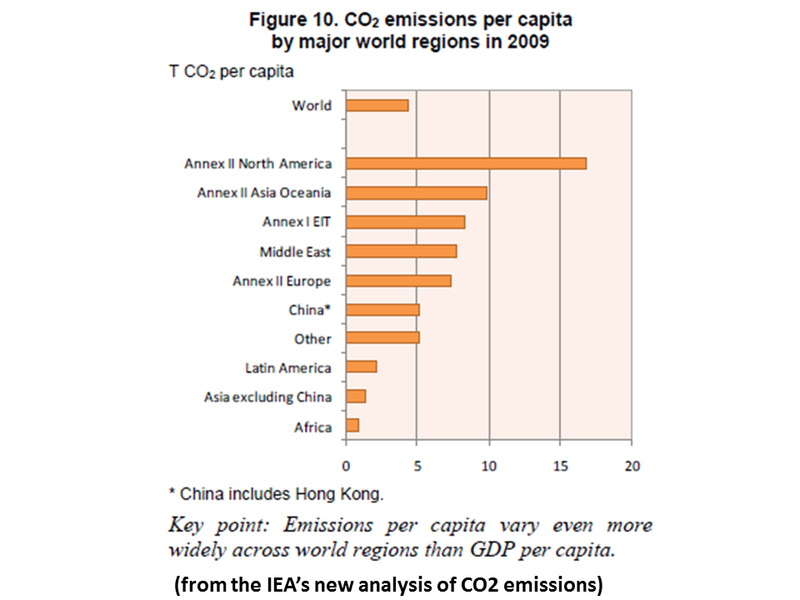 However, some rapidly expanding economies are significantly increasing their emissions per capita. 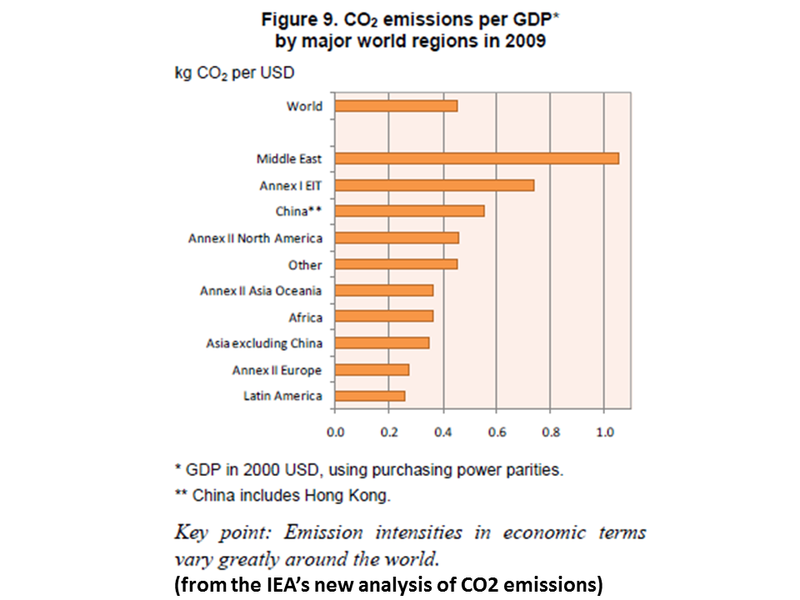 For example, between 1990 and 2009, among the top 5 emitting countries, China increased its per capita emissions by over two and a half times and India doubled them. 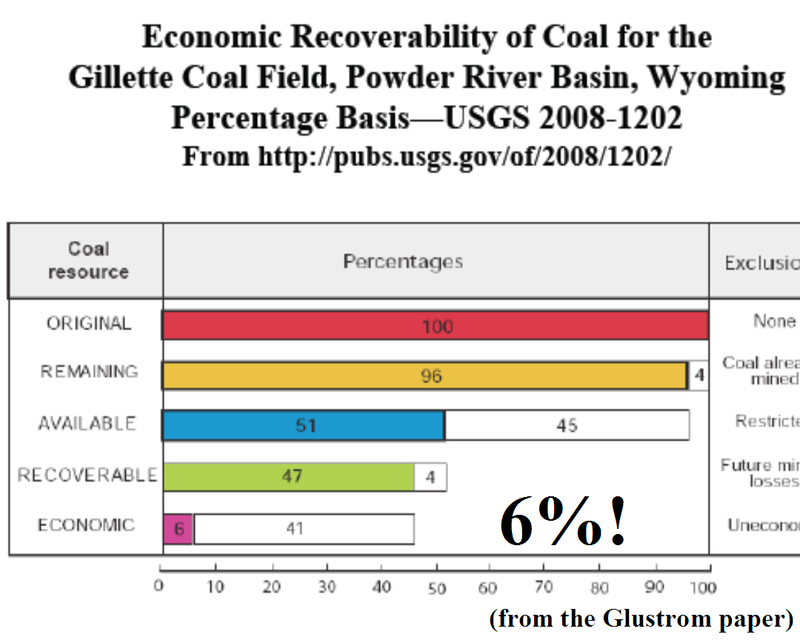 Clearly, these two countries contributed much to the 8% increase of global per capita emissions over the period. 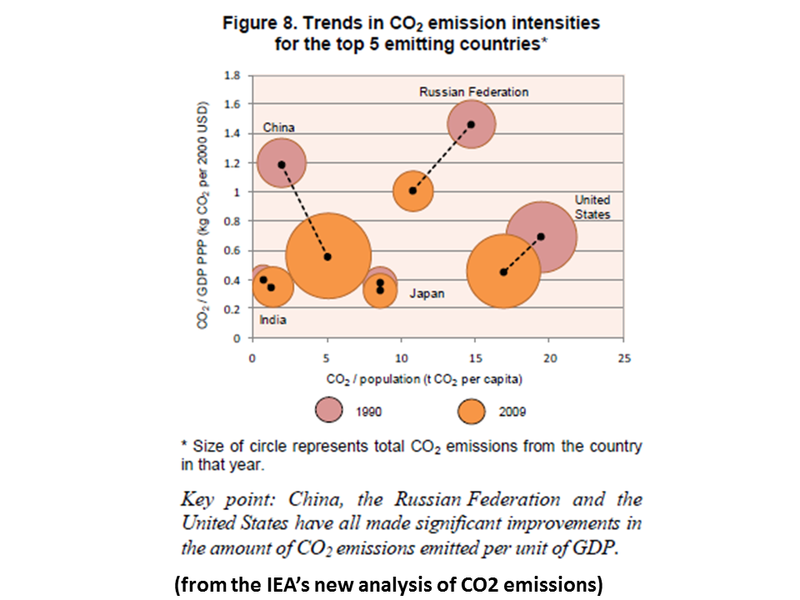 Conversely, both the Russian Federation and the United States decreased their per capita emissions significantly, by 27% and 13% respectively, over the same period. 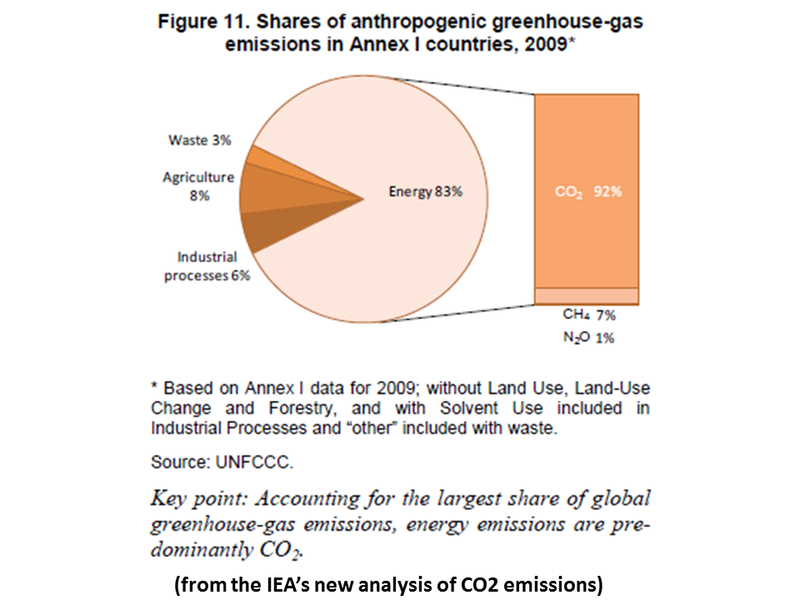 Until recently, industrialised countries have emitted the large majority of anthropogenic greenhouse gases. However shares of developing countries are rising very rapidly and are projected to continue to do so. To shift towards a low-carbon world, mitigation measures now taking shape within industrialised countries will need to be accelerated, and complemented by comprehensive efforts worldwide. Complementing various national policies and measures, the Kyoto Protocol of the UNFCCC is so far the most comprehensive binding multinational agreement to mitigate climate change. Having entered into force in February 2005, the Protocol commits industrialised countries (as a group) to curb domestic emissions by about 5% relative to 1990 by the 2008-12 first commitment period. The Protocol also creates “flexible mechanisms” by which industrialised countries can transfer emission allowances among themselves and earn emission credits from emissions reduction projects in participating developing countries and EIT countries. Despite its extensive coverage (192 countries), the Protocol is limited in its potential to address global emissions since not all major emitters are included in reduction commitments. The United States remains outside of its jurisdiction and though most developing countries (i.e. non-Annex I countries) have signed the Protocol, they do not face emissions targets. 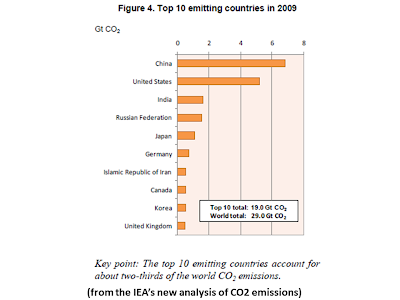 The Kyoto Protocol implies action on less than one-third of global CO2 emissions, as measured in 2008 (Table 1). The Protocol has made carbon a tradable commodity, and has been a key driver for the development of emissions trading schemes as detailed below. Emissions trading schemes (ETS) are developing or being proposed in several regions and countries around the world. Some are operational (EU ETS, New Zealand, Norway, Tokyo, Switzerland, the Regional Greenhouse Gas Initiative in the United States, Alberta, Canada and New South Wales, Australia) while others are under active development (California, Australia, Korea, China). Given the significant uncertainties surrounding future international climate commitments, policy makers have allowed flexibility in changing design options over the longer term. Indeed, lessons from the first years of existing schemes are helping the elaboration of others (Hood, 2010). In the European Union, the largest scheme in operation is the EU ETS, which covers emitters in the energy and industrial sectors (aviation will be added from 2012), representing about 45% of the energy related CO2 emissions of the region. Norway’s ETS is fully linked to the EU system. The lessons from its first two phases have helped to shape the scheme’s post-2012 design (Ellerman et al., 2010). In December 2008, the European Council and the European Parliament endorsed an agreement on the climate change and energy package which implements a political commitment by the European Union to reduce its greenhouse-gas emissions by 20% by 2020 compared to 1990 levels.10 The package also includes a target for renewables in the EU set at 20% of final energy demand by 2020. The EU ETS will play a key role in achieving this target, as the 2020 emissions cap for ETS installations is 21% below the actual level of 2005 emissions,11 or 34% below if the overall target moves to a 30% reduction. There will be a significant increase in the proportion of allowances auctioned rather than allocated for free, including full auctioning (in general) for the power generation sector. Continued use of credits from the Kyoto Protocol flexible mechanisms Clean Development Mechanism (CDM) and Joint Implementation (JI) will be allowed, with both quantitative and qualitative restrictions. In New Zealand, a comprehensive economy-wide emission trading scheme (NZ ETS) is being progressively introduced, starting with the forestry sector in January 2008. The energy, transport and industrial sectors are included from July 2010, and waste and agricultural emissions enter by 2015. There is a transition phase from 2010 to 2012 with a capped price and partial obligations. The scheme is fully linked to the international Kyoto market, and allows unlimited use of Kyoto Protocol project and forestry credits. No emissions cap is specified: linking to the international market is intended rather to ensure that an appropriate carbon price is set in the New Zealand economy. 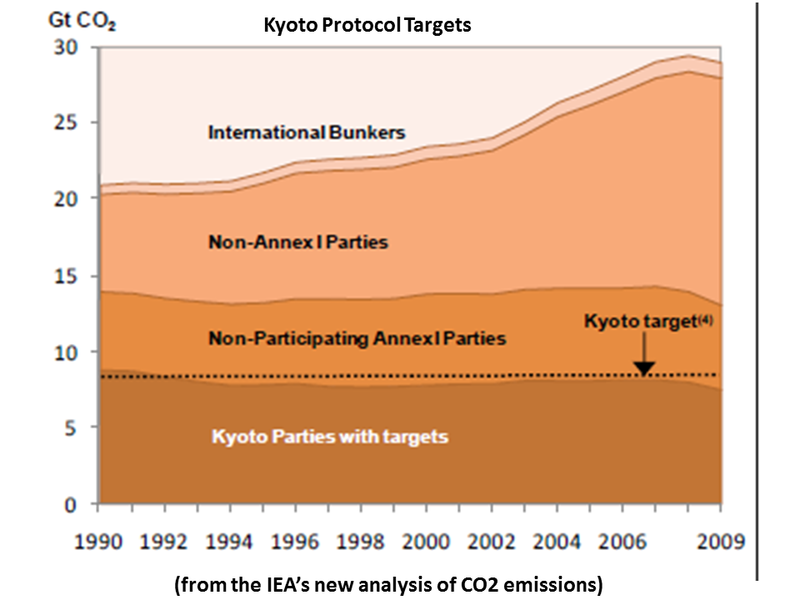 Several other ETS schemes are operating, including in countries that are not Parties to the Kyoto Protocol. 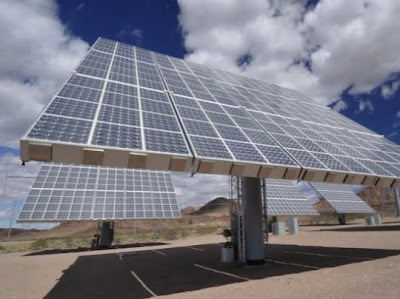 In the United States, the first regional scheme (the Regional Greenhouse Gas Initiative covering the electricity sector in the northeastern states) began on 1 January 2009. Small schemes are also in place in New South Wales (covering the power sector), Tokyo (covering commercial sites) and Alberta (covering large emitters). Switzerland’s ETS allows companies to manage their emissions through trading instead of facing the country’s carbon tax. A number of other domestic trading schemes are also under development, in both Annex I and non-Annex I countries. The Korean government has submitted legislation to establish an emissions trading scheme from 2015, to assist in delivering Korea’s target of a 30% improvement on business-as-usual (BAU) emissions by 2020. The Australian government also has legislation progressing to implement emissions trading, with a fixed-price transitional period starting in 2012, moving to full trading in 2015. As part of its 12th five year plan (2011 to 2015), the Chinese government is investigating options for ETS pilots in two provinces and four cities. These pilots are to be developed by 2013, to inform the potential implementation of a nation-wide policy after 2015. 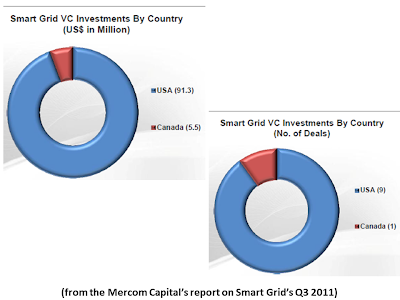 California also intends to begin trading in its domestic market in 2013, and other US states and Canadian provinces may link to the California scheme thereafter under the umbrella of the Western Climate Initiative. An important development in 2011 was the launch of the World Bank’s Partnership for Market Readiness, which provides funding and technical assistance to developing countries for capacity building toward the development and piloting of market-based instruments for greenhouse gas reduction. Chile, China, Columbia, Costa Rica, Indonesia, Mexico, Thailand and Turkey received grants in the first round of funding. Held in late 2005, the first Meeting of the Parties to the Kyoto Protocol (COP/MOP1) witnessed the official opening of talks on post-2012 climate change policy. The Bali Road Map adopted at COP/MOP3 in Bali in 2007 established a two-track process, i.e. both for the Convention and Kyoto Protocol strands, aiming at the identification of a post-2012 global climate regime to be adopted by COP15 and COP/MOP5 in Copenhagen in 2009. In Bali, Parties organised two official fora: the Ad Hoc Working Group on the Kyoto Protocol (AWG-KP) and the Ad Hoc Working Group on Long term Co-operative Action (AWG-LCA). The AWG-KP focuses on the design of post-2012 commitments for Annex I Parties under the Protocol. Ideally, it would also provide some certainty to carbon-constrained investments in infrastructure and to the carbon market itself. However, the AWG has no mandate to encourage participation from non-Annex I Parties or from non-participating Annex I Parties. By contrast, the broader AWG-LCA was designed to enable full and sustained implementation of the UN Framework Convention on Climate Change by all Parties, up to and beyond 2012, through long-term cooperative action. While the Bali Action Plan, adopted under the Convention track, did not introduce binding commitments to reduce greenhouse-gas emissions, it included the request for developing countries to contribute to the mitigation of global warming in the context of sustainable development. In addition, the plan envisaged enhanced actions on adaptation, technology development and on the provision of financial resources, as well as measures against deforestation. The Bali Action Plan introduced a focus on mitigation actions by all Parties and the provision of financial resources by developed countries that are “measurable, reportable and verifiable”, now central to the establishment of a post-2012 framework for climate action. After the unprecedented move at COP15 and COP/MOP5 in Copenhagen, where heads of states and high-level representatives negotiated the Copenhagen Accord, COP16 and COP/MOP6 in Cancún were widely seen as having put the international negotiating process back on track. In Cancún the key elements of the Copenhagen Accord were formally adopted into the UN process, including the goal of limiting global temperature increase to less than 2°C above pre-industrial levels, commitments for the provision of financial resources, and sketching a framework for monitoring and reviewing mitigation actions and commitments. Annex I Parties submitted quantified economy-wide greenhouse-gas targets to 2020 as part of the accord, and several non-Annex I countries also listed mitigation actions, or sectoral or economywide greenhouse-gas targets. The Cancún meeting also set an ambitious forward work programme for issues to be considered in Durban at the end of 2011, including a peak year for global emissions, 2050 emissions targets, and options for new market-based mechanisms for emissions reduction. The challenge of post-2012 discussions is the need to engage developing countries with approaches, possibly including the carbon market, which suit their capacity and their legitimate aspiration for economic and social development. The Asia Pacific Partnership for Clean Development and Climate (APP or AP7), the G8 2005 Gleneagles Plan of Action, and the Major Economies Forum on Energy and Climate (MEF) and Clean Energy Ministerial processes seek to involve developed and developing nations in common measures to address climate change. Other international for a gathering both developed and developing countries have emerged to further mitigation efforts in specific areas, such as the Clean Energy Ministerial (CEM), the International Renewable Energy Agency (IRENA), and the International Partnership for Energy Efficiency Co-operation (IPEEC). 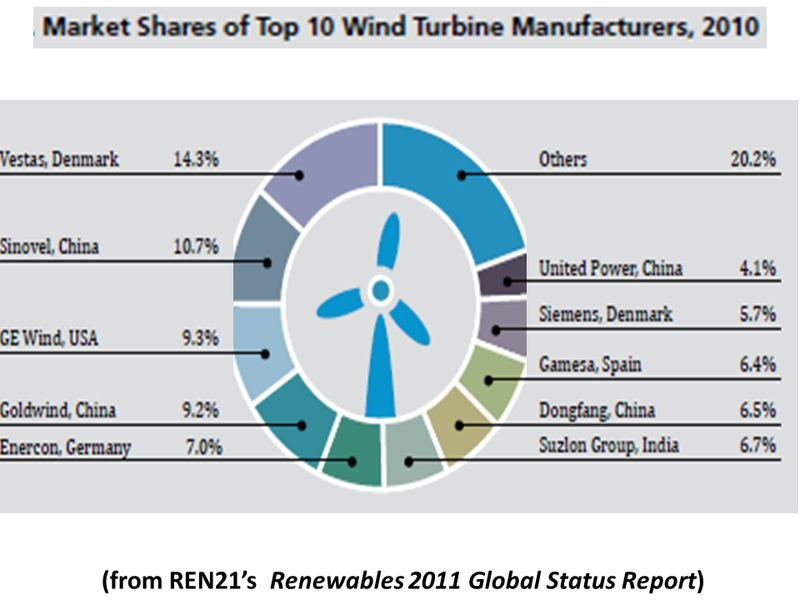 The AP7, which groups Australia, Canada, China, India, Japan, Korea and the United States, focuses on the emissions of specific sectors (iron and steel, cement, aluminium, mining, buildings and appliances) and the methods of clean fossil energy use, renewable energy generation and more efficient power generation and transmission. Canada, France, Germany, Italy, Japan, the Russian Federation, the United Kingdom and United States launched the July 2005 G8 Gleneagles Plan of Action to, in part, promote clean energy and sustainable development while mitigating climate change. The IEA was tasked under the Plan of Action to develop concrete recommendations to help the G8 achieve its clean energy objectives. Additionally, the G8 sought to engage South Africa, India, Brazil, China and Mexico in an official dialogue to address climate change, clean energy, and sustainable development worldwide. This commitment by the G8 was reiterated at all subsequent summits. The G20 summits have also served as a forum to advance climate change and clean energy discussions, including a commitment to rationalising and phasing out inefficient fossil fuel subsidies over the medium term. 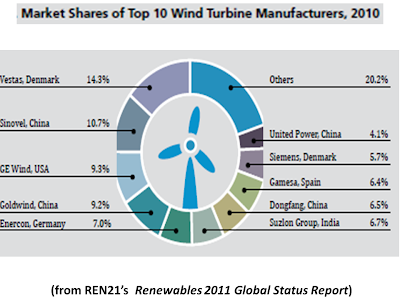 In 2011, the G20 formed a new Clean Energy and Energy Efficiency (C3E) Working Group to further its work in this area. 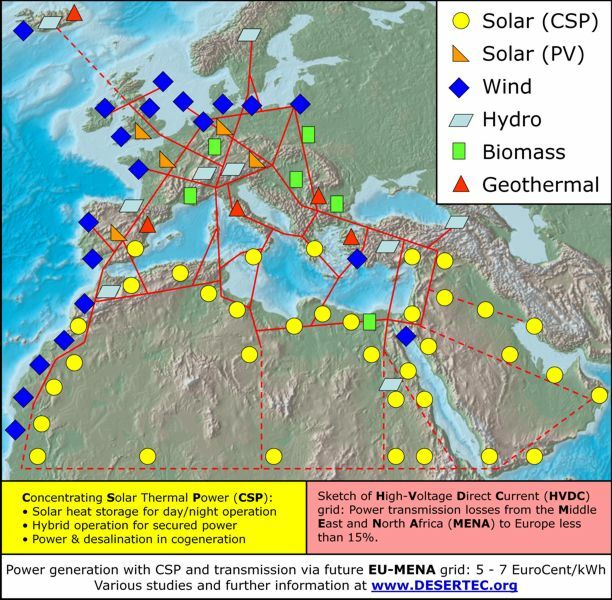 It remains to be seen how this group, whose membership has a high degree of overlap with the CEM and IPEEC will coordinate its work with those bodies. In all these efforts, timely and accurate CO2 and other greenhouse-gas statistics will prove central to ascertain compliance to international agreements and to inform policy makers and carbon market participants. The ability of countries to monitor and review emissions from their sources is essential in their engagement towards national and global greenhouse-gas mitigation. 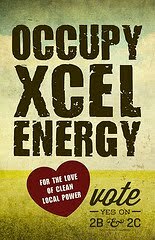 "NextEra Energy Resources owns and operates the plant and sells the power to El Paso Electric under a 25-year power purchase agreement." "The plant uses Amonix’s innovative concentrated photovoltaic solar power systems, which incorporate dual-axis tracking to maximize energy production throughout the day…"
…[P]lacing turbines in the right places [with the best wind] can make the difference between a really good investment in renewable energy, and a losing bet…But accounting for all the variables that together determine the “right place” hasn’t been easy…[T]here are just so many variables: changing weather patterns, prevailing wind directions, turbulence, the presence (or lack of) trees in the area, even aesthetics…[and they] interact in complex ways…[so] if one changes, many of the others will also change. 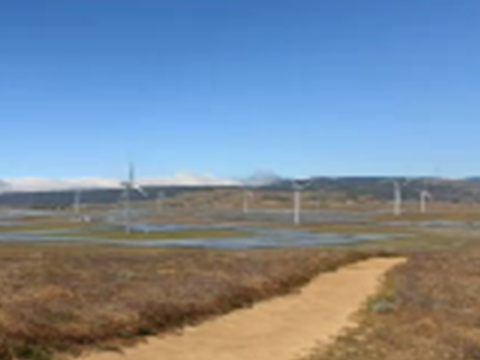 "Running those kinds of data through wind-turbine computer models used to take weeks. 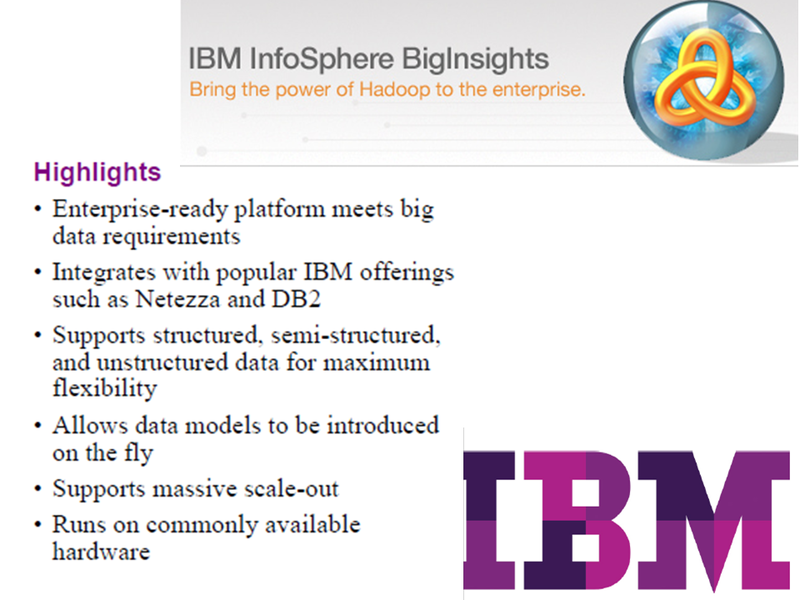 But IBM says it can now help wind-energy companies do those calculations in an hour or less…In fact, Big Blue has just started working with Danish wind-energy giant Vestas to do just that: crunch myriad facts and figures fast to help the company make the best siting decisions possible for its turbines." 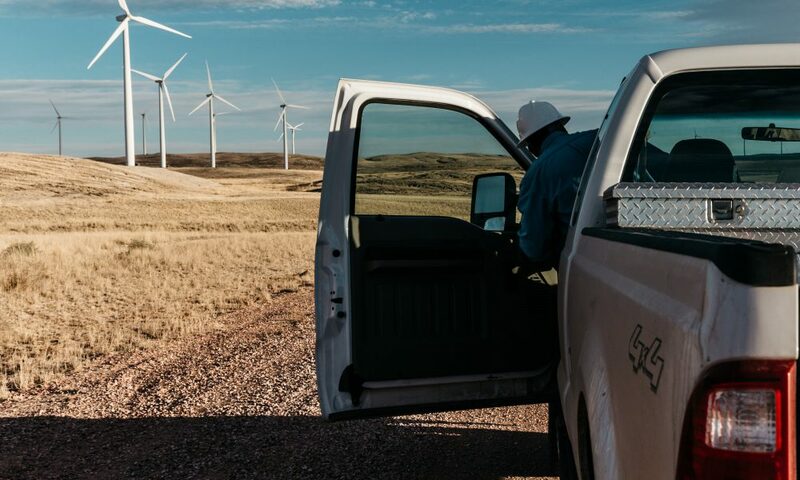 "Once each turbine is installed, Vestas engineers plan to use the IBM technology to predict turbine performance, analyze how each blade reacts to weather changes, and determine the best times to schedule maintenance. 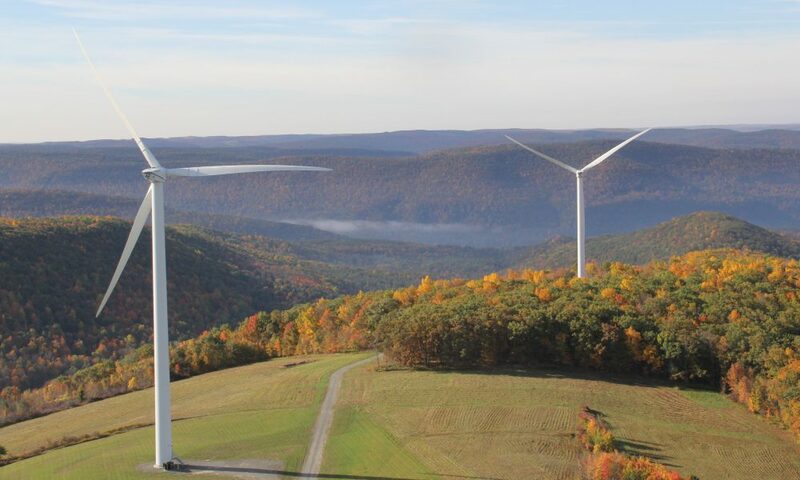 Over the next four years, the wind-energy company expects to crunch over 20 petabytes of data in an effort to continue fine-tuning its siting strategies…"
New Jersey American Water has energized a 135 kW solar array that floats atop a reservoir at the company's Canoe Brook Water Treatment Plant in Millburn, N.J… ENERActive Solutions of Asbury Park, N.J., designed and built the project, which consists of 538 modules." 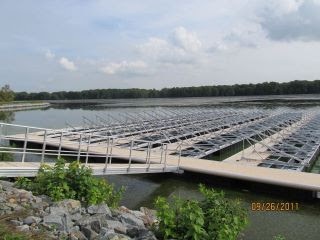 [Bob Biehler, senior project manager, New Jersey American Water:] "The support structure of the anchored array features a unique mooring system that allows it to rise and fall with the water level of the reservoir...The solar panels are fixed at a 14-degree angle and were specially made to endure the severe weather conditions - such as heavy wind, rain, snow and ice - that are not uncommon during northern New Jersey winters…"
Funding and M&A activity in Q3 2011 for the Smart Grid sector was anemic. 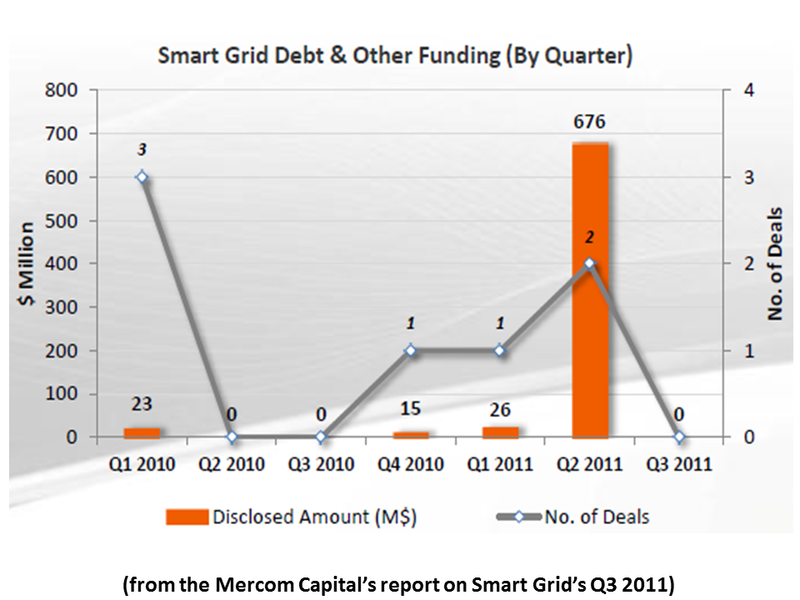 Funding activity so far this year has continued to be weak compared to 2010. 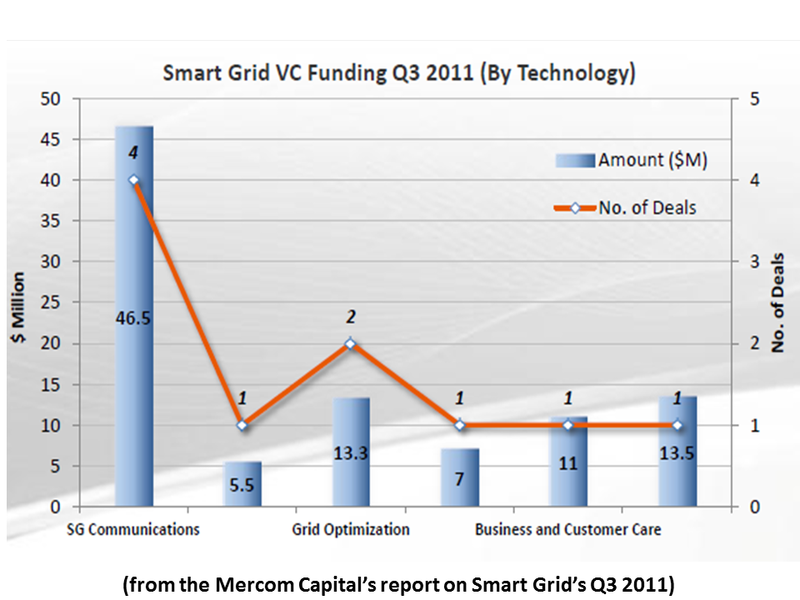 VC funding in Q3 2011 came to $97 million in 10 deals, which was slightly lower than the $104 million in 15 deals in Q2 2011. 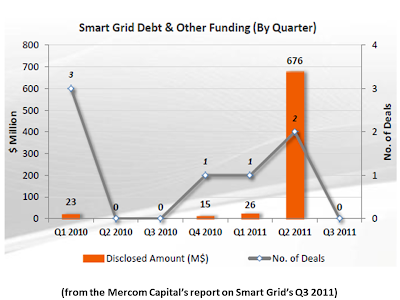 Current economic condition and uncertainty along with a lack of clear direction in the Smart Grid sector is plainly evident based on the depressed funding activity so far this year. VC funding in Q3 2011 came to $97 million in 10 transactions. 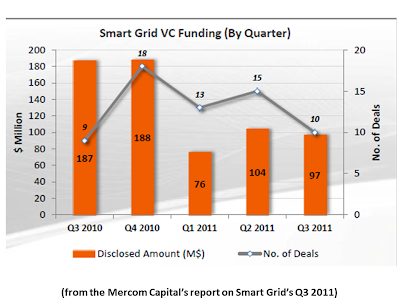 In comparison, VC funding in Q2 was $104 million in 15 transactions. Thirty-one different investors were involved in these funding rounds. 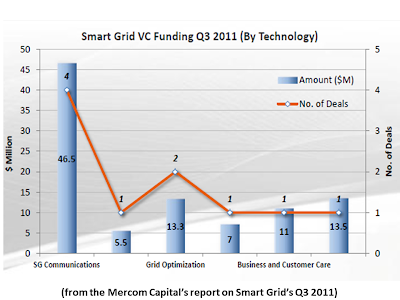 Smart Grid Communications led VC funding in terms of technology with $47 million in four deals. Year-to-date Smart Grid Communications companies have received the most funding with $135 million in 13 deals. 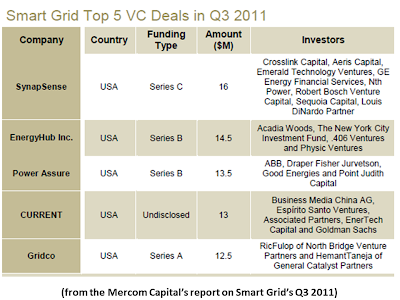 Top VC funding deals in Q3 were: $16 million raised by SynapSense in Series ‘C’, $15 million raised by EnergyHub in Series ‘B’ and $14 million raised by Power Assure in Series ‘B’ round. 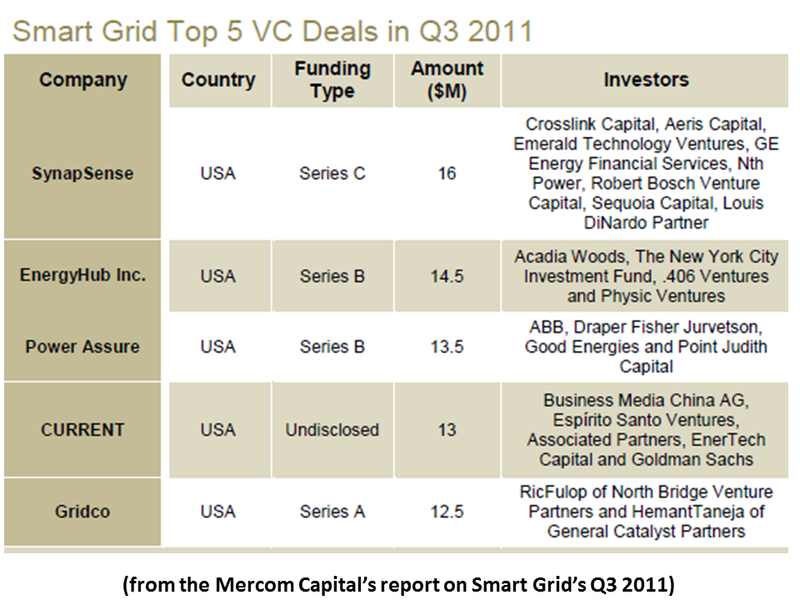 Most VC investments recorded in Q3 of 2011 were based in the United States. 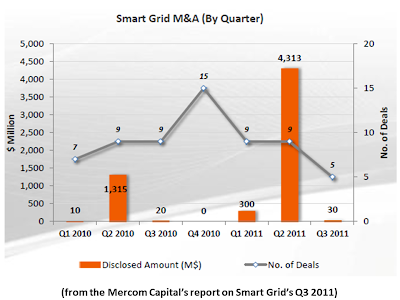 Merger and Acquisitions activity in Q3 2011 was very weak with transactions amounting to only $30 million in five deals. Only one deal disclosed transaction details. 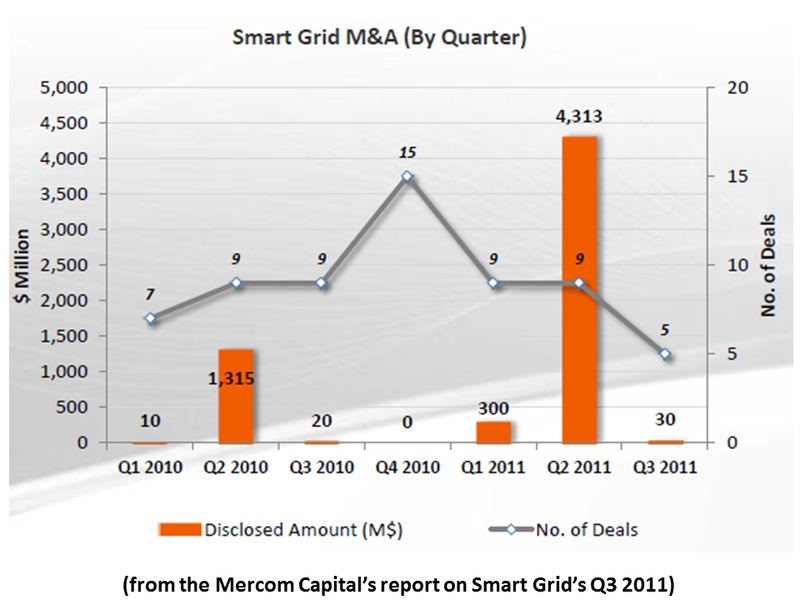 In comparison, Q2 2011 was a huge quarter for M&A where nine deals resulted in $4.3 billion in M&A transactions. 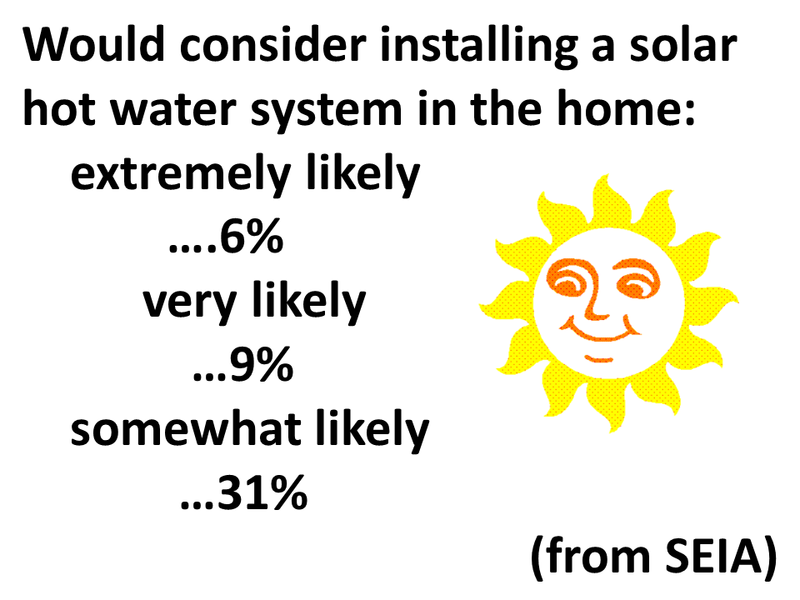 "…[A Solar Energy Industries Association (SEIA) national poll]…found that the public strongly supports solar water heating systems and the sector's potential for economic growth and job creation. 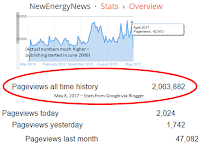 "…[It] showed that 74% of Americans agree that the solar water heating industry will produce jobs and help the U.S. economy. 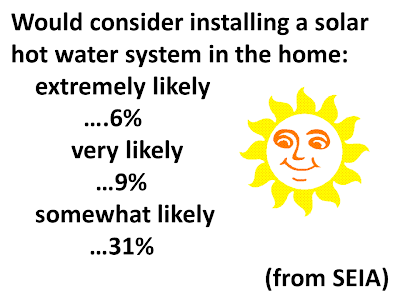 Positive perceptions of solar water heating systems exceeded negative perceptions by more than 10 to 1 (48% to 4%). More broadly, solar energy is considered the energy source most deserving of U.S. government support…"
"In other survey findings, 46% say they would either be "extremely likely" (6%), "very likely" (9%) or "somewhat likely" (31%) to consider installing a solar water heating system in their own home. "The cost of purchasing the system" (72%) and "the cost of maintaining the system" (56%) are the top two concerns for residents in all regions and across key demographic/partisan groups." 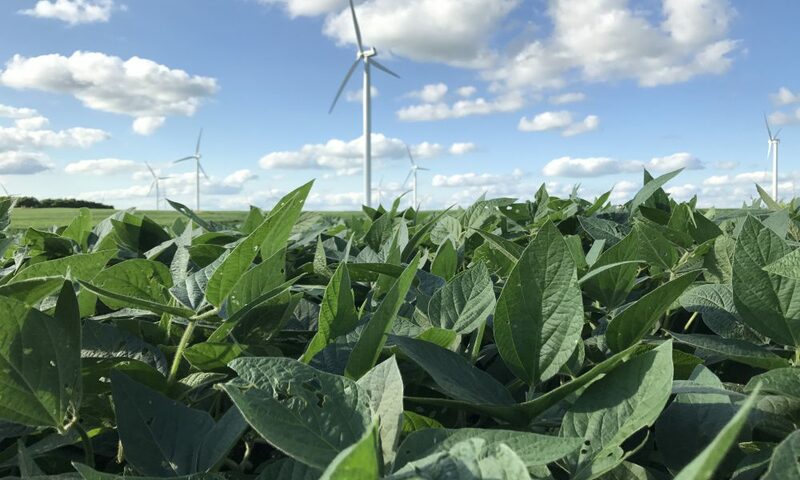 "Wisconsin is home to more than 300 companies serving wind and solar energy markets…[including] old-line manufacturers that are expanding and entrepreneurial new firms focused on the clean energy sector. 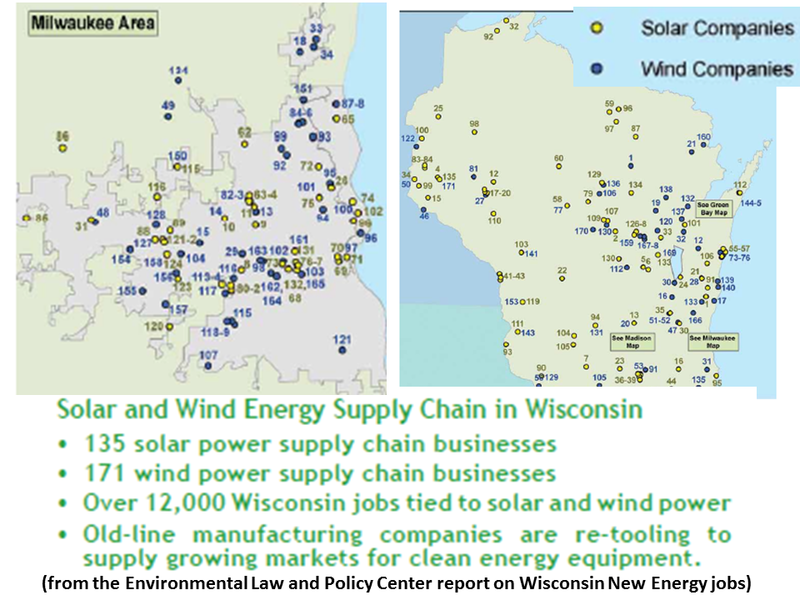 Businesses in the wind and solar energy sectors in Wisconsin employ approximately 6,000 and there are an additional 6,000 employees whose jobs are at least 50% tied to the renewable energy sector. "These businesses operate throughout the entire supply chain, from manufacturing and systems design, to site planning, engineering, construction and installation. They include startups and long established companies. 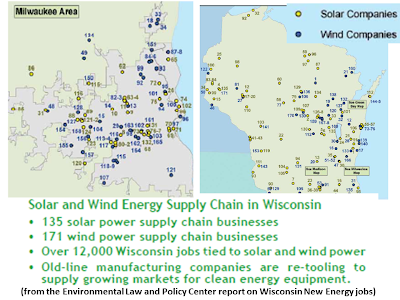 Wisconsin is ranked fifth nationwide for solar job employment…"
"Energy storage technologies, which offer the promise of enabling a wide range of long-duration and short-duration applications for purposes of balancing electricity grid operations, are gaining increased momentum in the global marketplace…[T]he industry still faces a variety of challenges including technology development and the need for cost reduction…"
"…[A] new tracker report from Pike Research indicates that nearly 600 energy storage projects have been announced or deployed worldwide, with a surge of new project activity during the past decade…"
"Pike Research’s Energy Storage Tracker 4Q11 aims to identify key market trends on a holistic basis by systematically compiling the available data on all projects around the world including analysis of site, region, size, status, duration, market segment, applications and funding profiles." The insurance industry is a key driver of the global economy, its products and actions stimulating trillions of dollars in private investment and influencing business activity across all sectors. Insurance also deeply affects societal behaviors from driving habits to personal health decisions to corporate investments. But climate change is altering the industry’s global business landscape and the risk models on which it crucially depends. 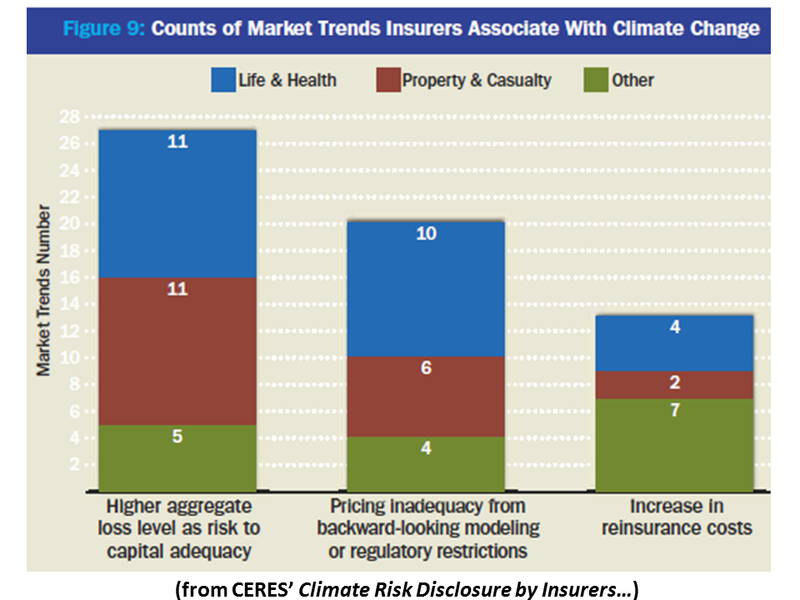 After centuries of operating in a relatively stable global climate, insurers are facing more volatile weather patterns driven by rising temperatures and human activities likely causing them. As the National Association of Insurance Commissioners (NAIC) itself has noted1, this fast-emerging threat will have broad impacts across the industry, clouding its ability to price physical perils, creating potentially vast new liabilities and threatening the performance of its huge investment portfolios. 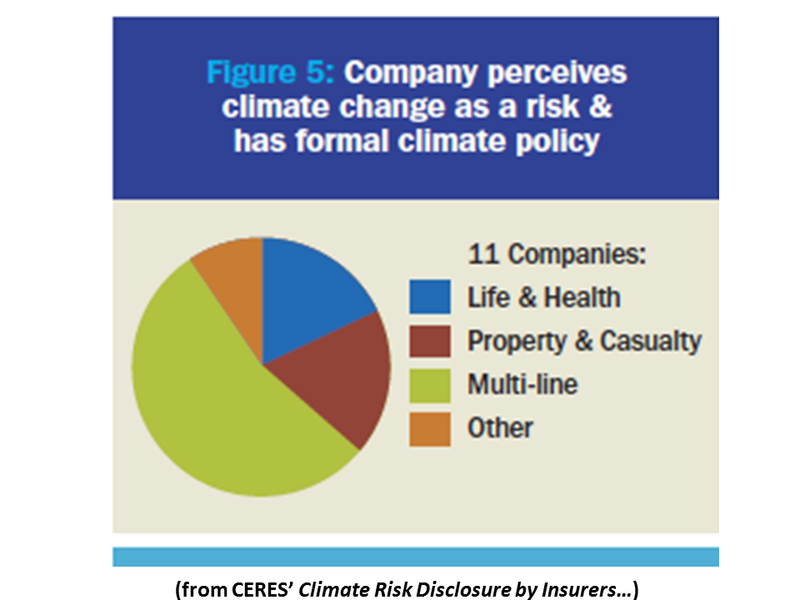 This Ceres report is the first attempt using public disclosure filings to evaluate the extent to which US insurers consider climate change a key risk factor to their business, and if so how they are factoring it into governance practices, management strategies and day-to- day decision making. The analysis is based on responses by 88 insurers to a 2010 survey from the NAIC. The disclosures were filed with insurance regulators in six states: New York, New Jersey, California, Oregon, Pennsylvania and Washington. The NAIC survey, while incomplete, provides an unprecedented view into climate risk perception and management within the insurance industry. The survey responses paint a picture of an industry that, outside of a handful of the largest insurers, is taking only marginal steps to address an issue that poses clear threats to the industry’s financial health, as well as to the availability and affordability of insurance for consumers. 1-There is a broad consensus among insurers that climate change will have an effect on extreme weather events. More than three-quarters of insurers responding to the survey name perils that may be affected by climate change. 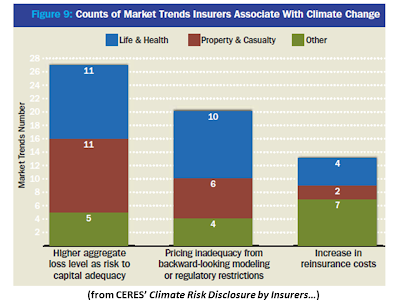 More than half name market segments, such as homeowners or marine insurance, which may be affected by climate change. 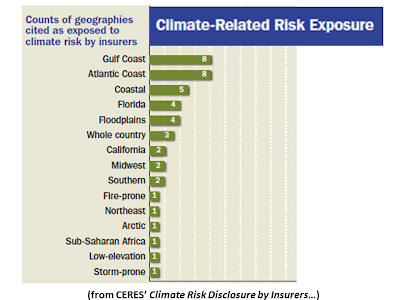 And a third of insurers name climate-affected geographies. Even those insurers with no formal climate policy, no climate risk management structure and a stated belief that the company is not vulnerable to the effects of climate change still name perils that may be affected by climate change 20 percent of the time. 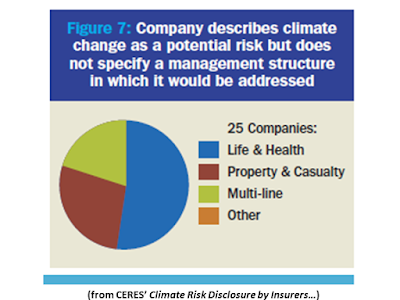 2-Yet despite widespread recognition of the effects climate change will likely have on extreme events, few insurers were able to articulate a coherent plan to manage the risks and opportunities associated with climate change. Of 88 companies surveyed, only 11 reported having formal climate change policies, and more than 60 percent of the respondents reported having no dedicated management approach for assessing climate risk. This was not true uniformly across the industry, however. capacity to identify and manage climate risks experience excessive capital losses. 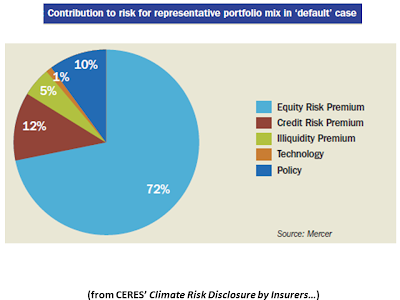 Some of the largest players in the industry—particularly in property and reinsurance— are investing considerable resources into understanding the risks and developing strategies that may drive more climate-resilient underwriting practices and capital decisions. Seven of the 11 companies that report having formal climate policies are multi-line insurers (those with diverse business, including life & health in addition to property & casualty) and one is a global reinsurer, most with annual premiums well above $1 billion. Only two life insurers, Prudential Insurance Co. of America and Genworth Life Insurance Co. of New York, report having a formal climate policy. None of the 18 property & casualty companies surveyed have formal climate change policies or explicit board or executive oversight of this key issue. Based on these disclosures, there appears to be significant asymmetry between market segments in climate risk management, with broad cross-sections of the market having no apparent system for identifying or addressing climate risks. Of particular concern to regulators, the most vulnerable companies tend to be within the segments of the market that are closest to consumers. 4-The industry is focusing most of its attention on a narrow set of risks, ignoring issues like non-coastal extreme weather and climate liability, which may prove to be significant. 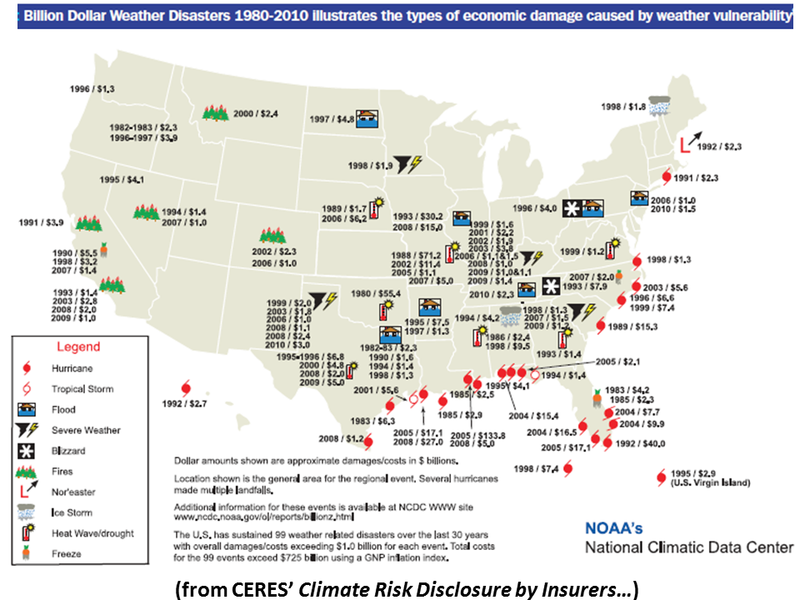 With some important exceptions, the industry is largely focused on the implications of climate change for hurricanes and other coastal events. While this is understandable given the financial risks associated with major hurricanes, recent years have demonstrated that the climatic effects of rising temperatures are likely driving up aggregated losses from smaller, non-modeled events—including perils such as floods, droughts, snowstorms, hailstorms and tornadoes—in ways that severely cut into insurer profitability. Climate change has also become the subject of significant litigation in recent years, a trend which is likely to grow as the physical impacts of climate change become more pronounced and affected parties seek redress in the courts. Litigation risk is conspicuously absent from the disclosure filings of some insurers indemnifying defendants in ongoing litigation. In fact, no insurers name any historic or ongoing litigation in which they are implicated through liability contracts. Given the significant defense costs associated with these cases, and the scale of the potential liability (which many in the industry have likened to losses sustained through asbestos and tobacco liability), the omission of liability risk exposure should be of particular concern to regulators and shareholders. 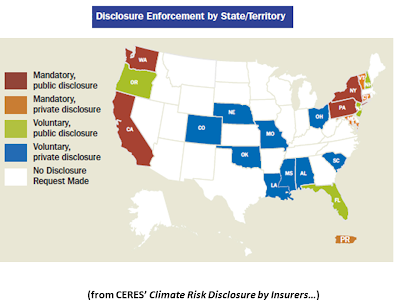 There are important exceptions to the overall scant disclosure around the specific risks that insurers face from climate change. For instance, the filing by Harleysville, a relatively small P&C insurer, contains an account of historical changes in tornado events which provides a clearer picture of an insurers’ view about changing extreme event trends. PMA Group’s Pennsylvania filing also captures an unusual degree of specificity between discussion of perils and geographies, and provides a window into the uncertainty inherent in risk modeling and emerging liability exposures that may compound insurance losses from more volatile or extreme weather. 5-The majority of insurers that report using catastrophe models describe them in terms that suggest their company does not have a clear understanding of how the models can or cannot be used to anticipate changing risk. Most of the industry relies on third-party catastrophe risk models that only marginally integrate changing extreme weather. Only the largest insurers have the capacity to develop their own internal models; the vast majority of carriers rely on models provided by third-party vendors. The P&C industry’s reliance on ‘cat’ models to set pricing and exposures means its risk view is largely shaped by these vendors. The vast gulf in scientific expertise between the largest insurers and the average company is evident in insurers’ discussions of catastrophe modeling. In reality, and despite what many insurers seem to believe, catastrophe models shaping pricing across the industry only marginally incorporate changing climate trends. Of the insurers with property exposures, 23 describe using cat models. Only eight suggest that today’s catastrophe models may be insufficient to help their company or the industry at large to manage climate change. Those companies that describe limitations of the industry’s existing risk modeling tools tend to be those with the capacity to develop their own loss models. In contrast, companies that rely solely on third-party models almost uniformly believe those models to include all relevant climate change trends. Given this market asymmetry, regulators should be aware that many of the smaller companies operating within their states are likely setting pricing based on flawed beliefs of how the proprietary models work. In contrast, larger insurers more readily recognize the inherent limitations of current catastrophe models in light of changing climate than do their smaller competitors. These larger players have a clear competitive advantage in deploying resources to build the latest climate science into their pricing models. Without explicit education and dialogue between reinsurers, modelers, brokers and primaries, the gulf between the most sophisticated insurers and the rest of the industry in terms of the capacity to anticipate nonlinear climate change trends will persist. This puts consumers and the industry as a whole at risk. 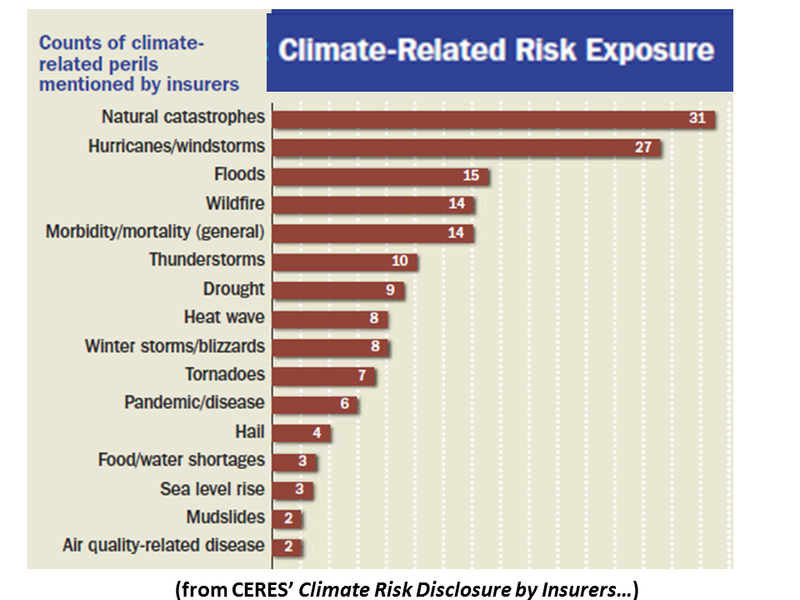 6-While climate change poses significant financial risk for the industry, few insurers provided meaningful information on the potential financial impacts of more volatile weather losses. 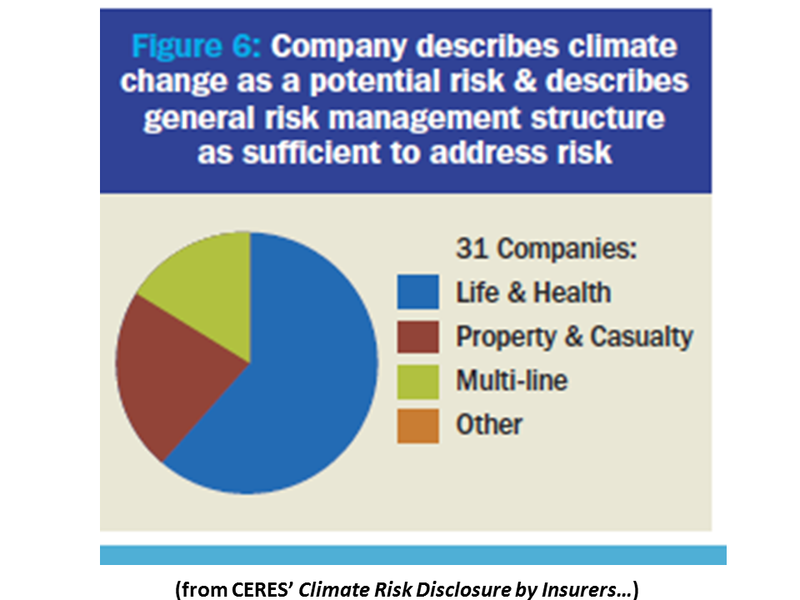 More than 40 percent of insurers that see their company having climate risk exposure provide no information on the potential effects climate change may have on the company’s pricing, capital adequacy or reinsurance requirements. Of those that do discuss the potential financial risks from climate change, only 18 percent outline actionable steps being taken to manage those risks. This should be of particular concern to regulators and shareholders, as it suggests that most companies may not be adjusting their pricing and capital allocation approaches despite growing evidence of the potential for extreme and volatile losses. 7-Just as climate change may substantially increase insured losses, it also threatens the performance of the vast investment portfolios insurers rely on to meet their liabilities. The insurance industry controls more than $23 trillion in global investments, making it one of the world’s largest investors. Investment advisor Mercer calls climate change a systemic risk, estimating in a recent report that it could introduce as much as 10 percent portfolio risk for institutional investors—including those with diversified holdings in sovereign fixed income, equity, credit and agricultural assets. 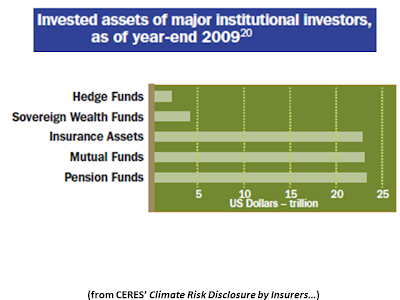 Mercer suggests that traditional asset allocation strategies will not be enough for investors to manage climate risk. Despite such recommendations, our analysis shows that only a few insurers have explicit investment policies in place for managing climate change. These exceptions include Chartis, AXA Group and Swiss Re, all three of which include climate in broader investment commitments for integrating ESG (environmental, social and governance) factors. In contrast, most companies view climate change as a slow-burning economic risk that will happen in time frames well in excess of their investment horizons. The NAIC’s 2010 inaugural survey—and the results and findings documented in this report—provide an unprecedented view of climate risk perceptions and climate-related management strategies within the insurance industry. 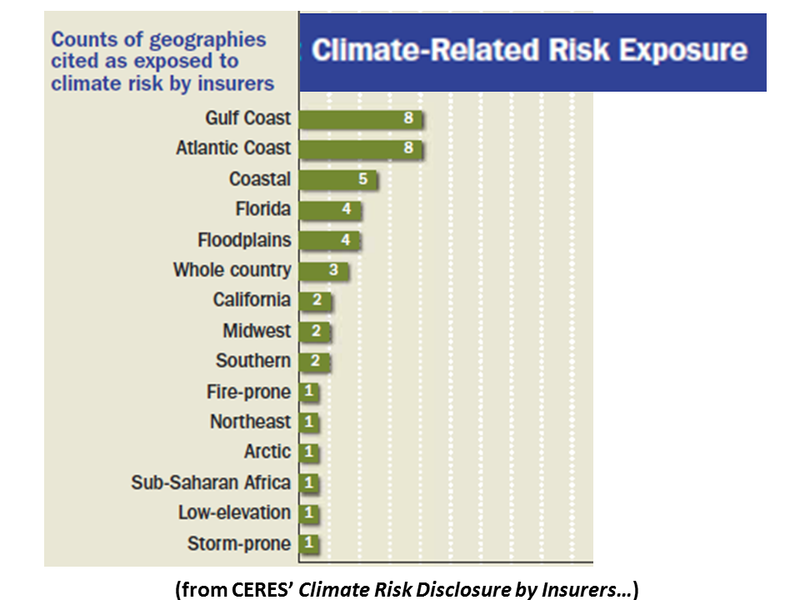 Our analysis shows widely varying and generally inadequate responses from US insurers—a shortcoming that limits regulators’ ability to oversee how insurers in their states are assessing and managing climate risks. 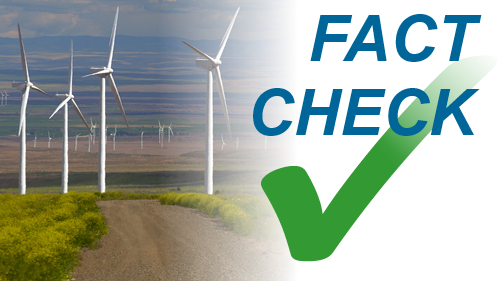 The current approach, with some states requiring responses to the survey and others making participation voluntary and non-public, has resulted in a patchwork of disclosure which does not provide a full sense of how the US industry as a whole is affected by and managing the impacts of climate change. The information provided through mandatory public disclosure can help other market actors identify market-wide failures in risk management and push for market corrections. In this respect, disclosure results should be used not only by regulators, but also by reinsurers, primaries and brokers to understand the direction the market is moving with respect to a risk factor that will profoundly shape industry performance in the coming years. The lack of specificity in the current NAIC disclosure survey has led to responses that are frequently vague and unhelpful, with little consistency in how insurers address major trends, including pricing, modeling and governance. Regulators should consider providing more detailed guidance documents in planning future survey responses. A useful model in this regard was disclosure guidance provided in 2009 and 2010 by the California Department of Insurance. • Investment Risks and Opportunities: Regulators could engage with investment consultants and asset managers to better understand insurer portfolio exposure and climate-sensitive asset allocation strategies. • Correlated Risks: An assessment of the potential for emergent correlated risks between insurers’ underwriting and investment portfolios would better inform future examination procedures. • Loss Modeling: Regulators and carriers would mutually benefit from clarification of how today’s loss models incorporate climate parameters. • Health and Life Loss Potential: Fundamental research on the temperature sensitivity of morbidity/mortality statistics would likely benefit insurers, regulators and public health professionals.